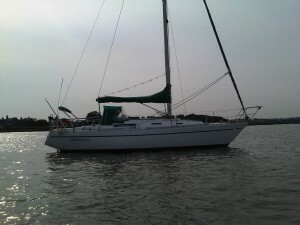 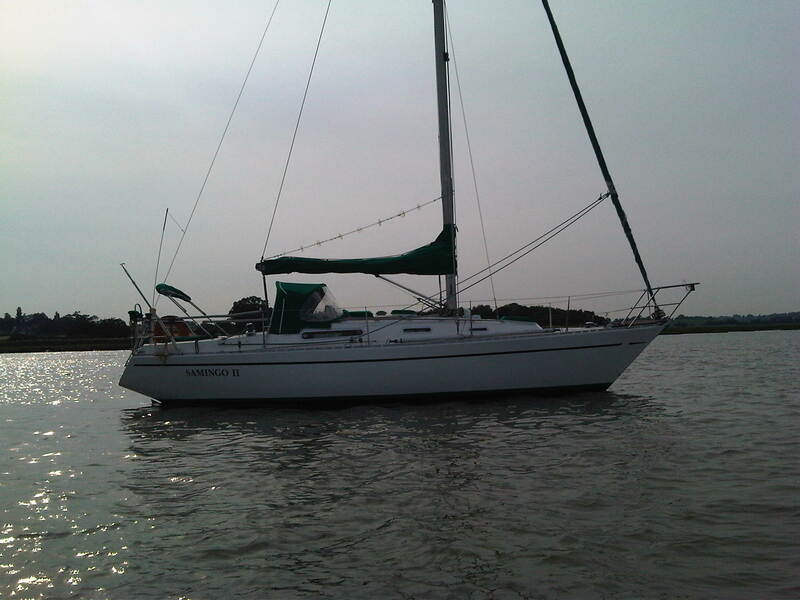 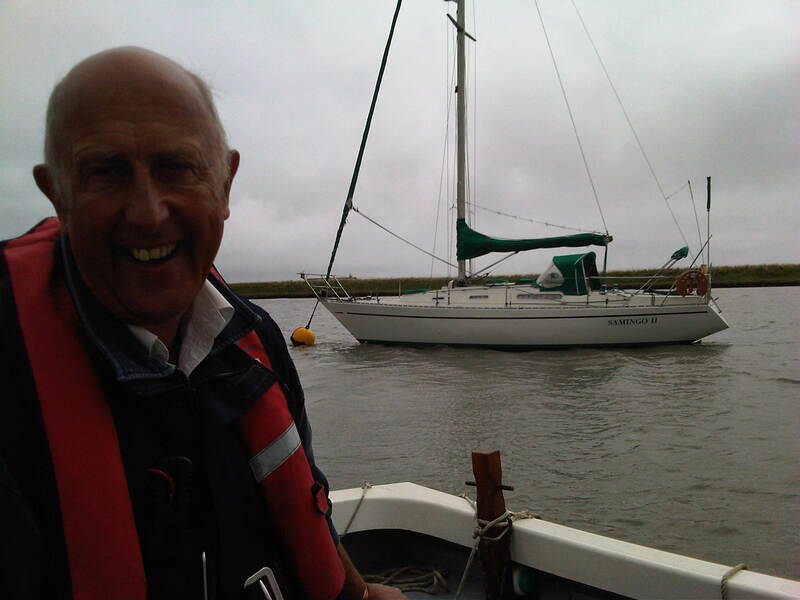 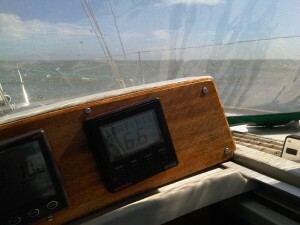 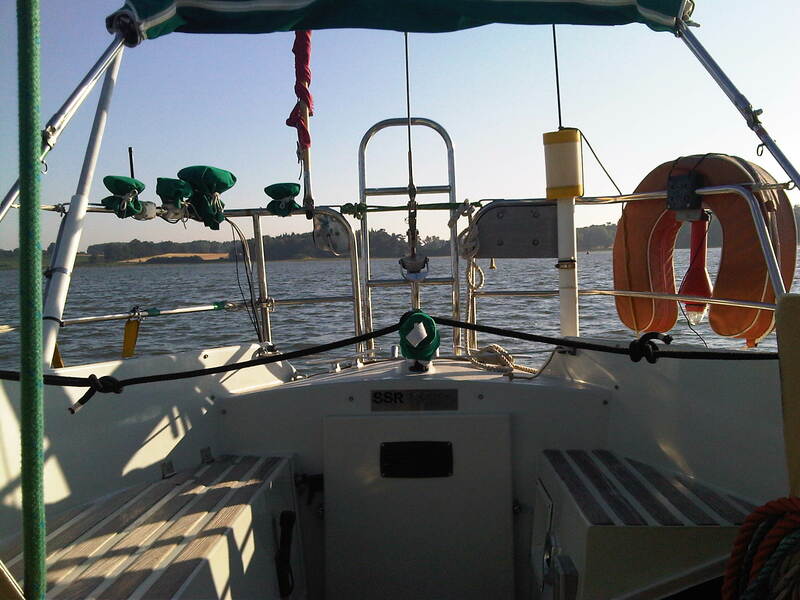 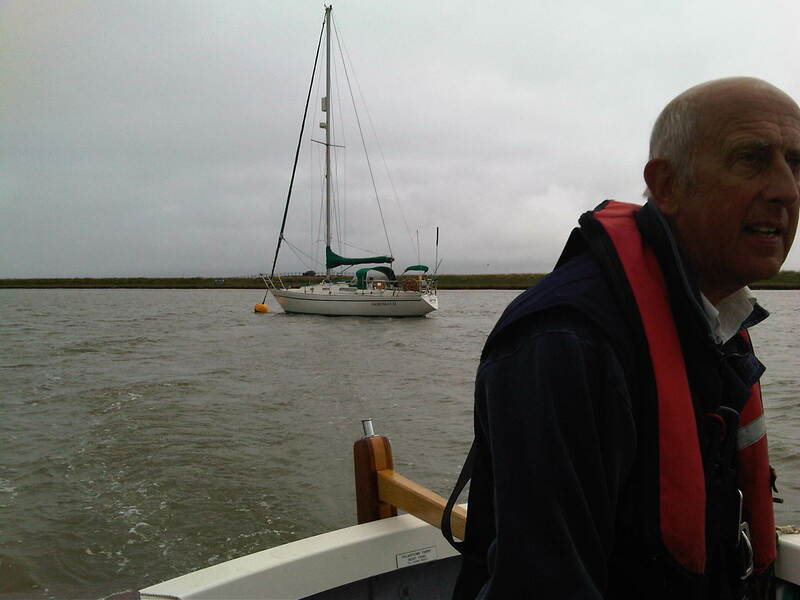 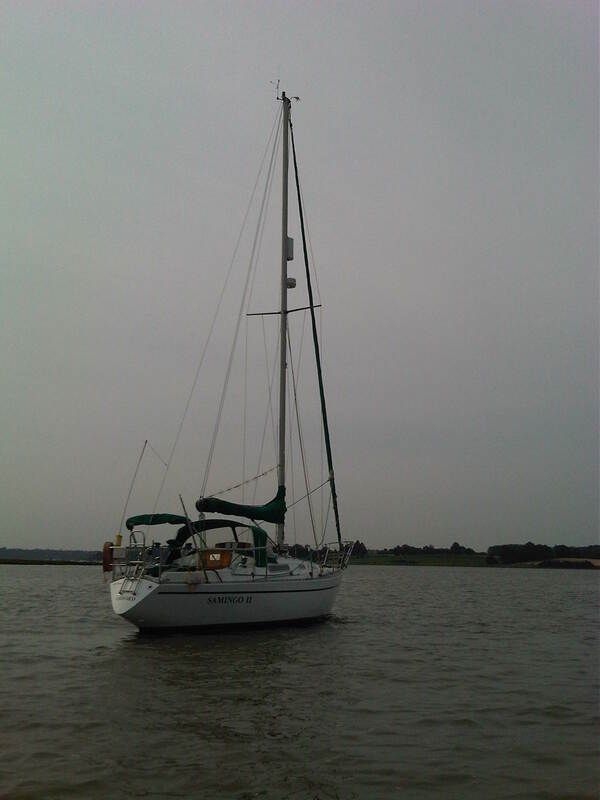 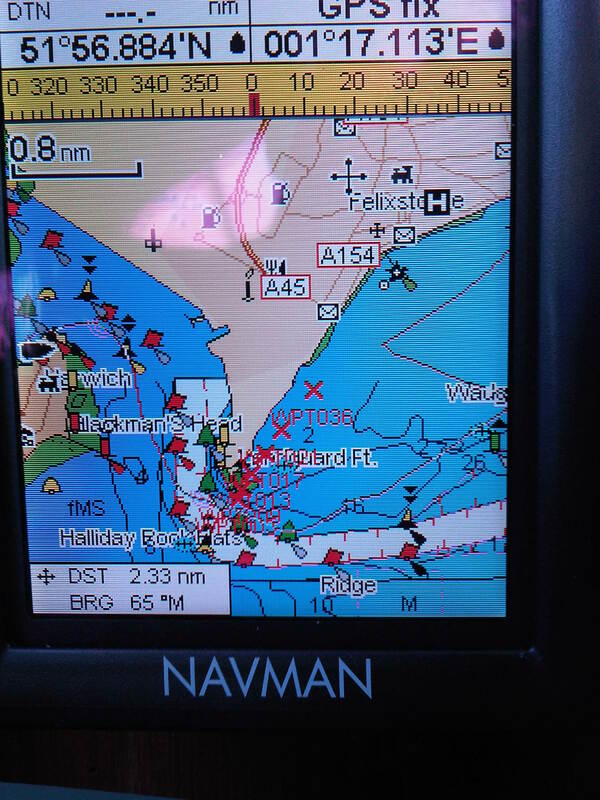 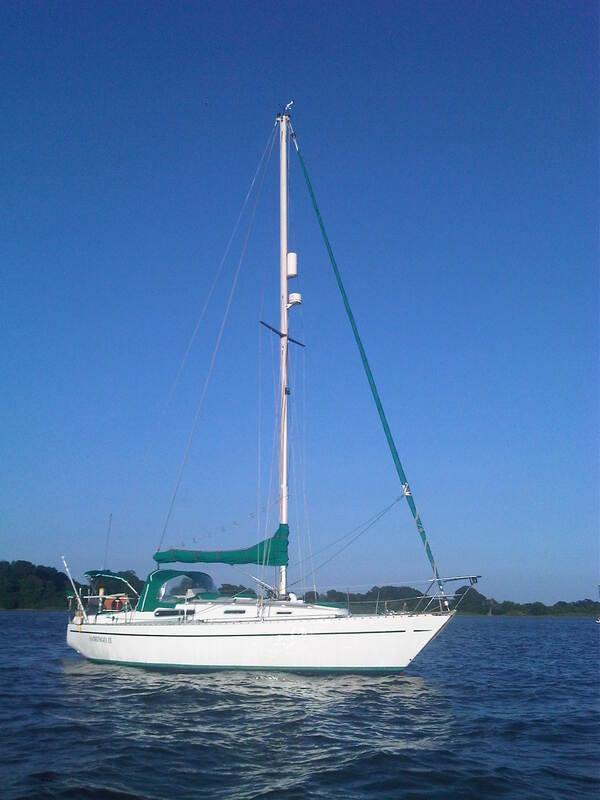 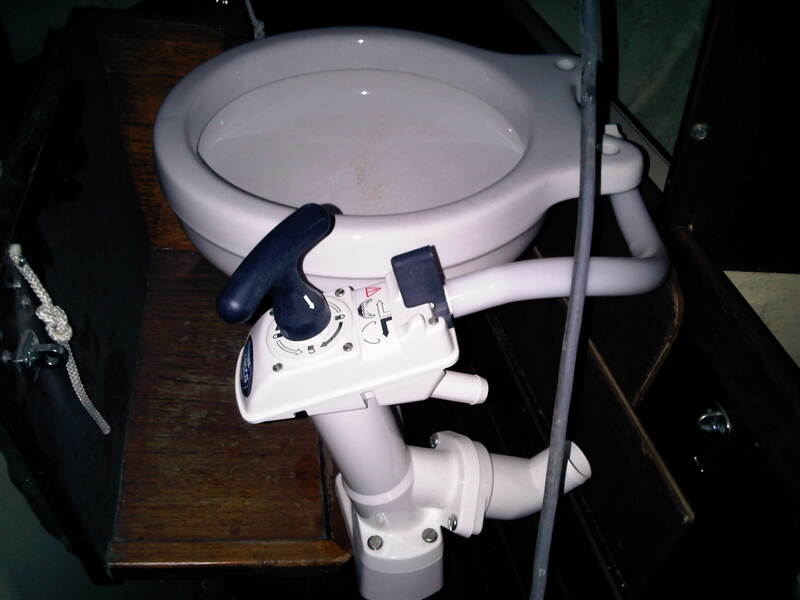 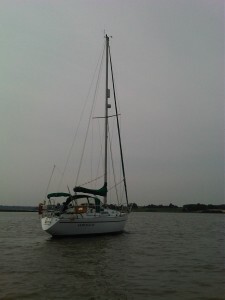 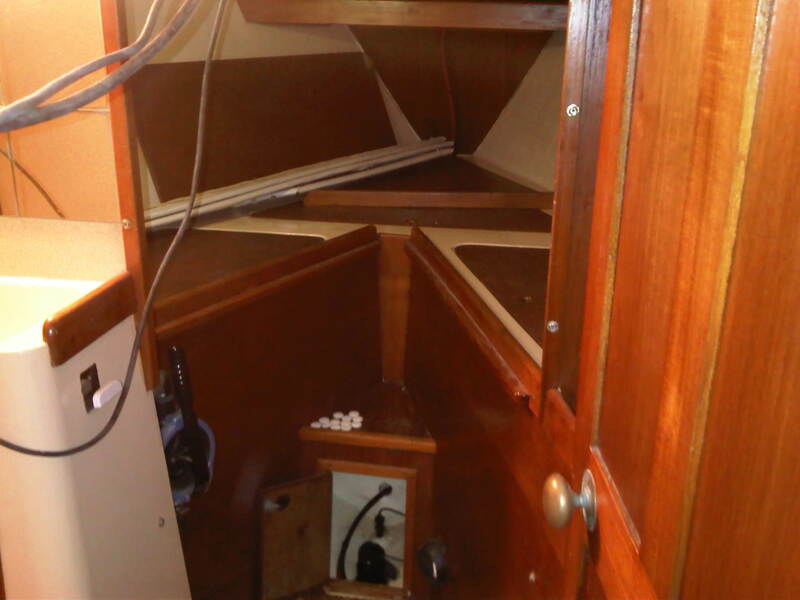 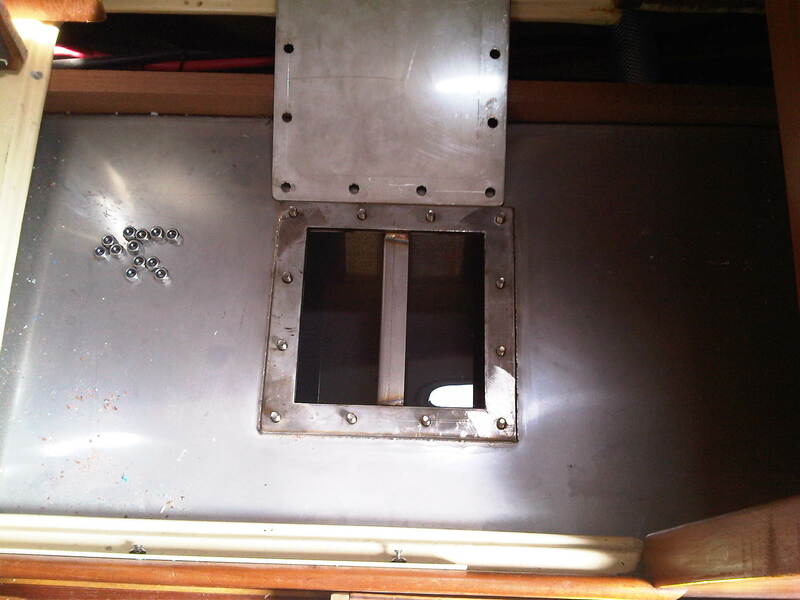 Suffolk YH with Steve Larkman for the final item that could cause a minor leak ….. the windlass. 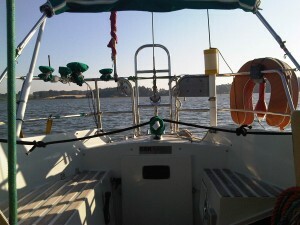 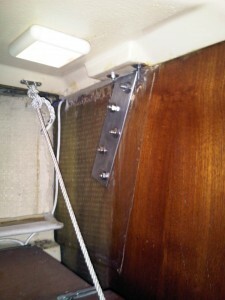 It proved to be the final problem to be solved although it took all day to remove, clean up and rebed the windlass. 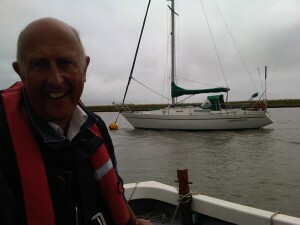 Our Quay Warden Philip collects S ll’s crew ..
Saturday 20th and home at last. 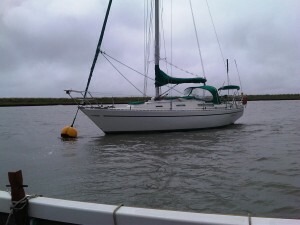 S ll’s mooring at Orford. 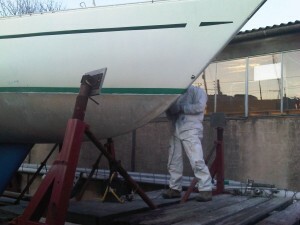 Thursday 18th and back to finish some jobs.. 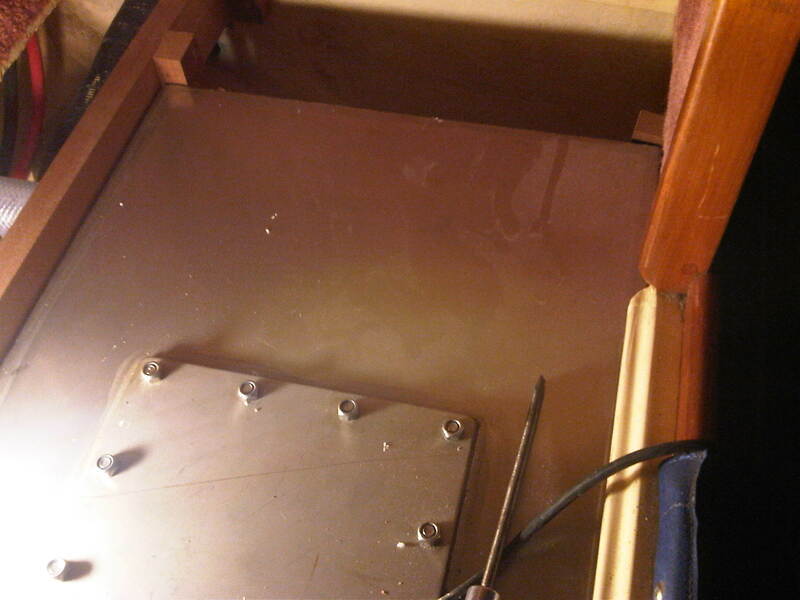 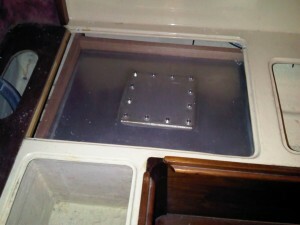 The galley sink had to come out for the tap to be replaced. 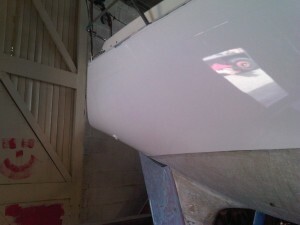 Half a turn on one of er,,,, many jubilee clips in the fresh water system and it was up and running. 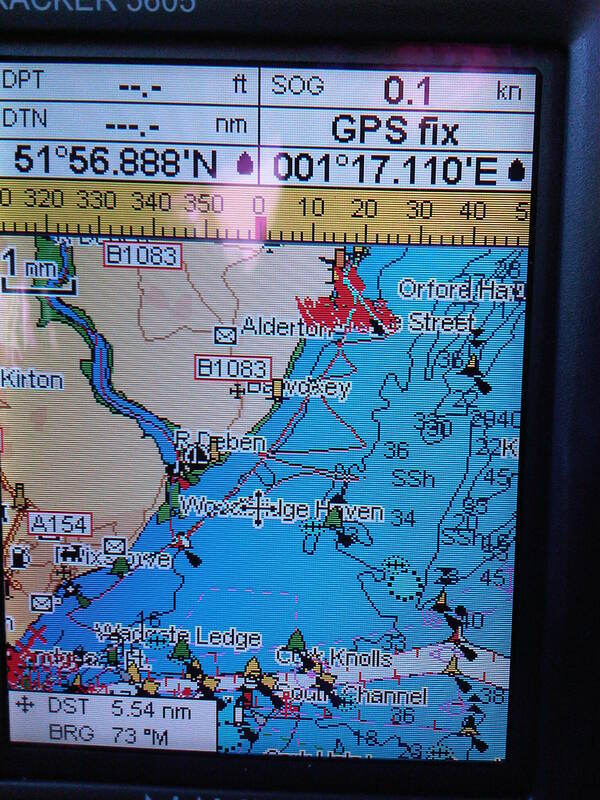 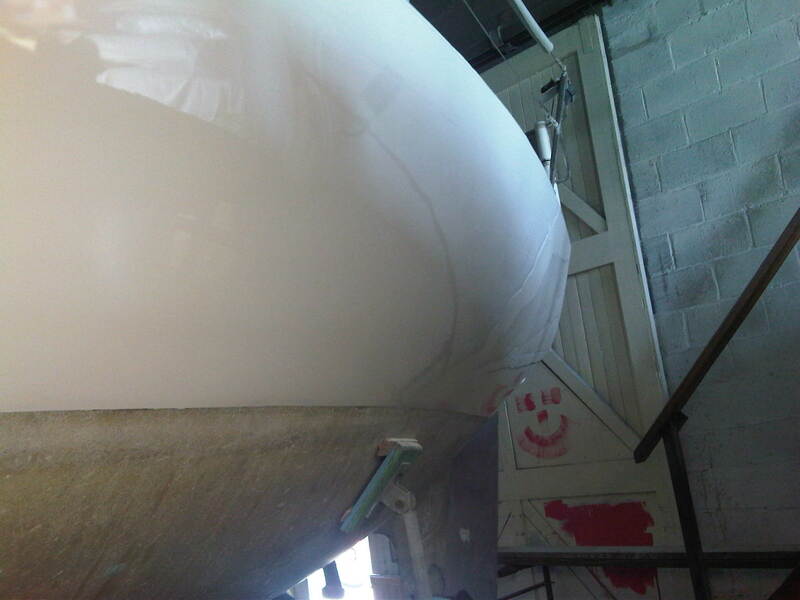 Sunday 14th July and sealing the inspection hatches on the new water tanks…..
And waiting for Mike, Tide Mill YH HM to call me in to a berth to load! 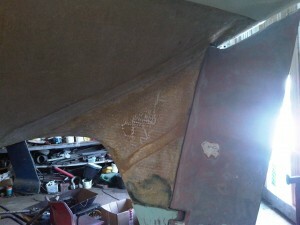 Steve is working on the boot top! 3rd July and brother Henry’s birthday! 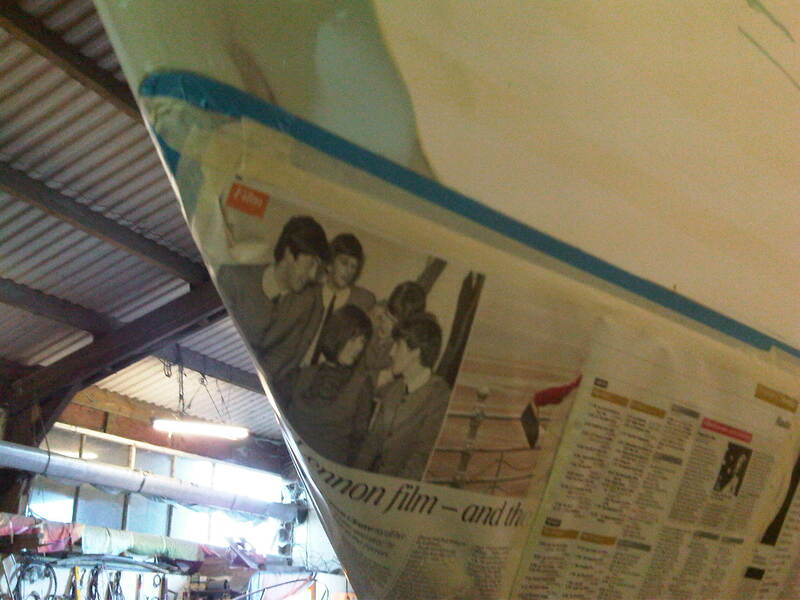 The Prop! 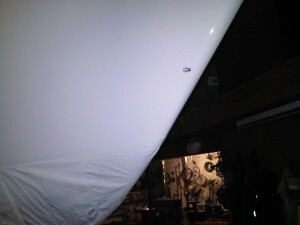 We have propulsion! 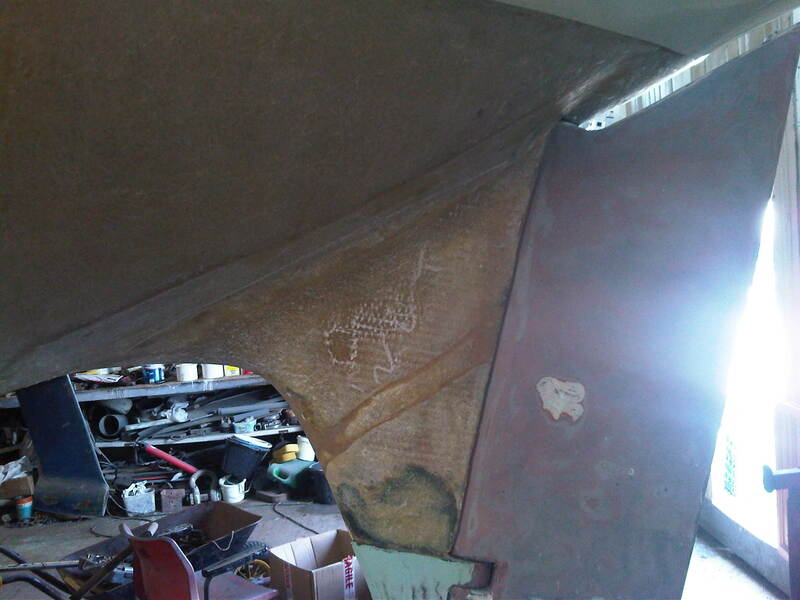 Just the boot top to do. Anxious to leave the Shed. 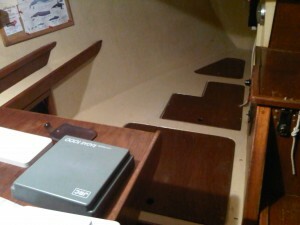 Then her port and SSR number. 2nd July. Two coats of anifoul and she has her name back. 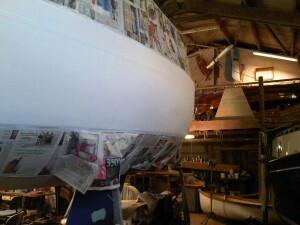 We will launch in the next TEN DAYS. 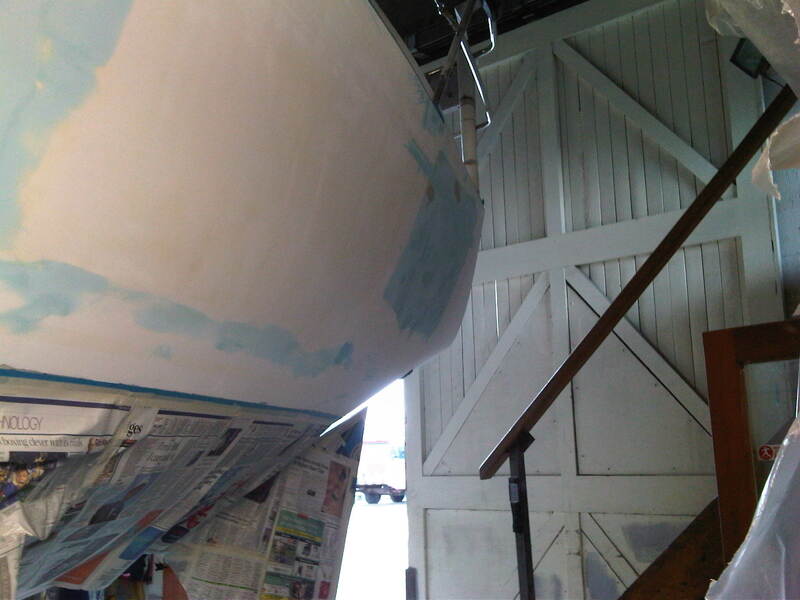 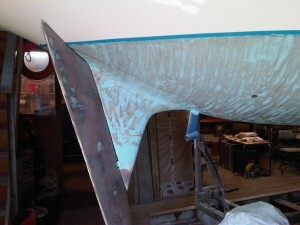 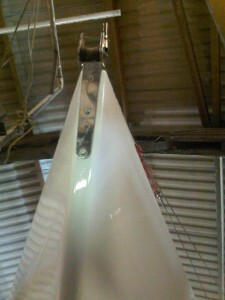 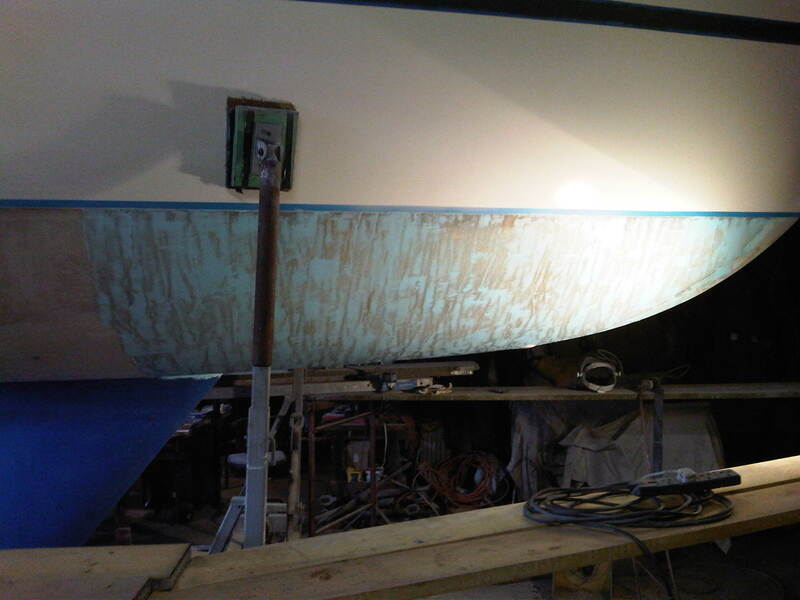 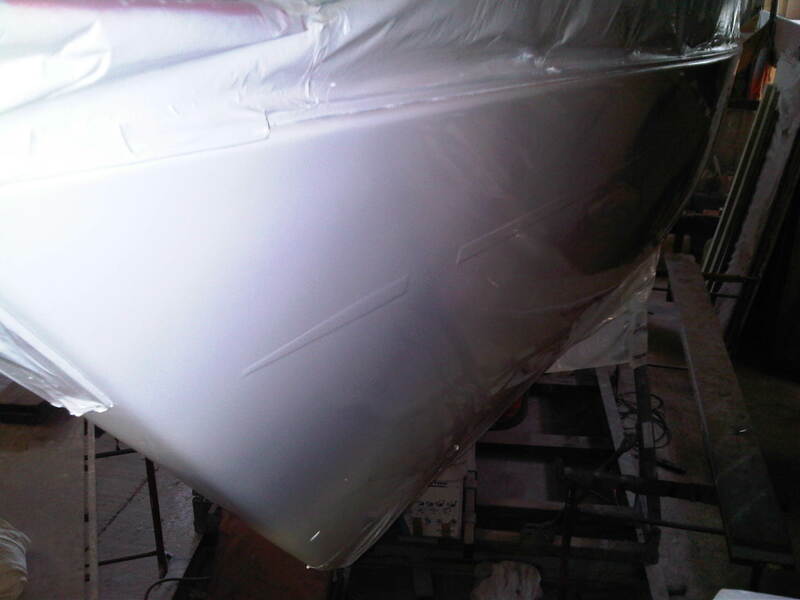 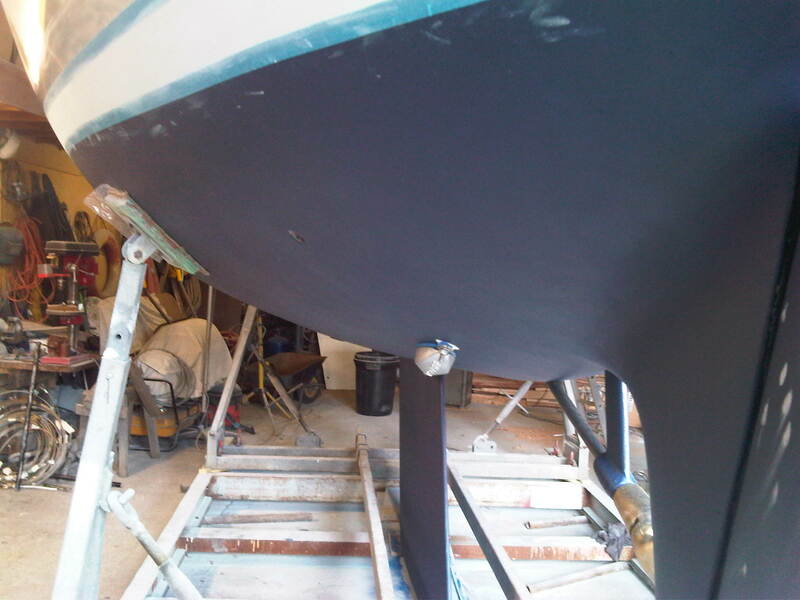 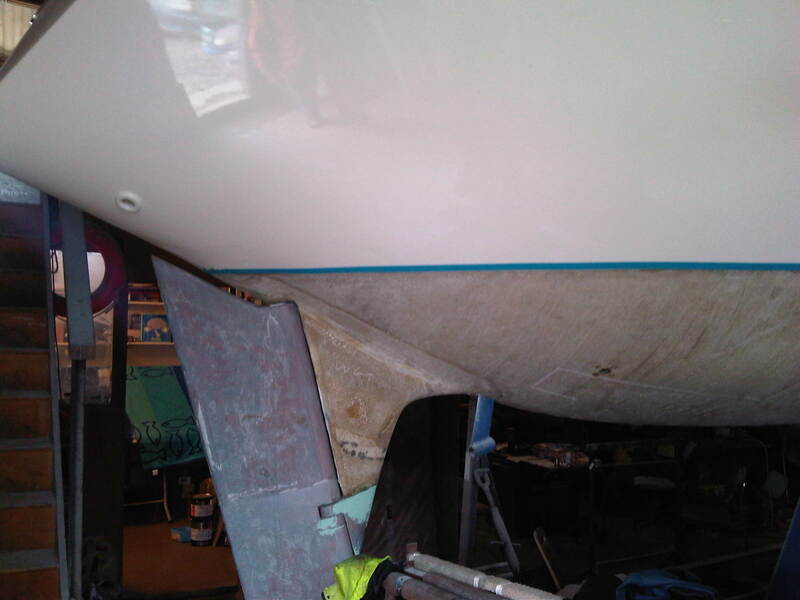 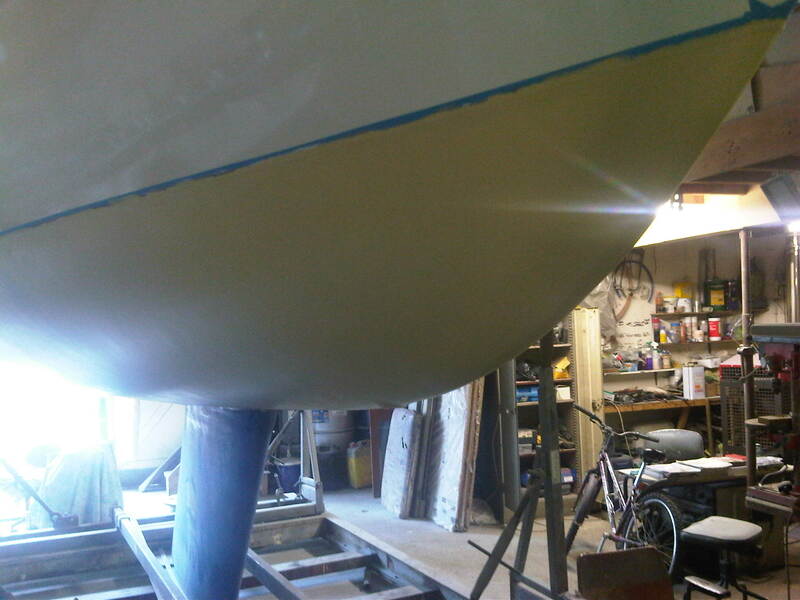 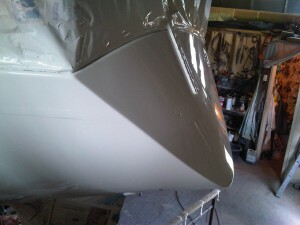 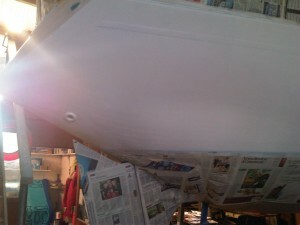 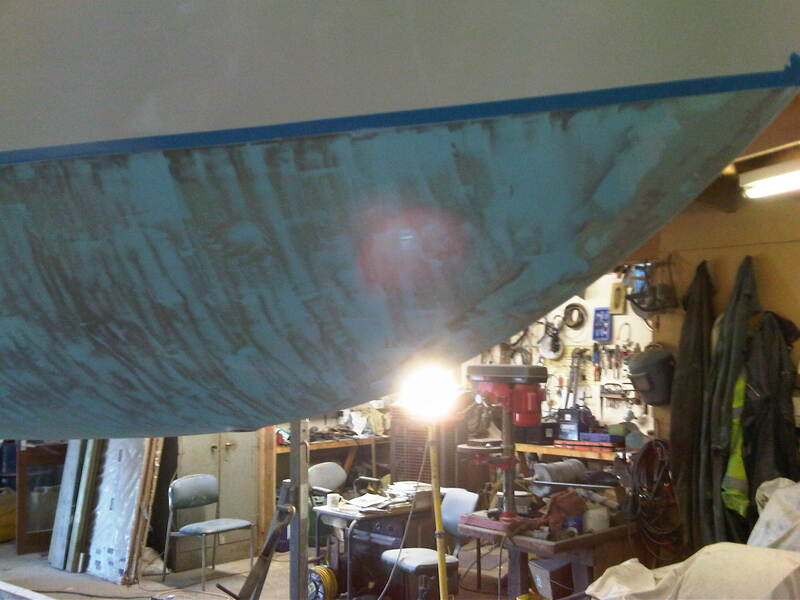 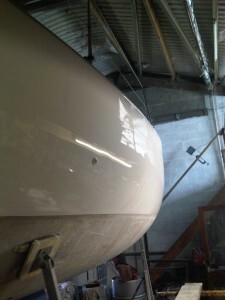 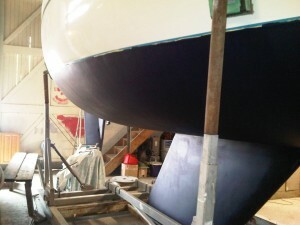 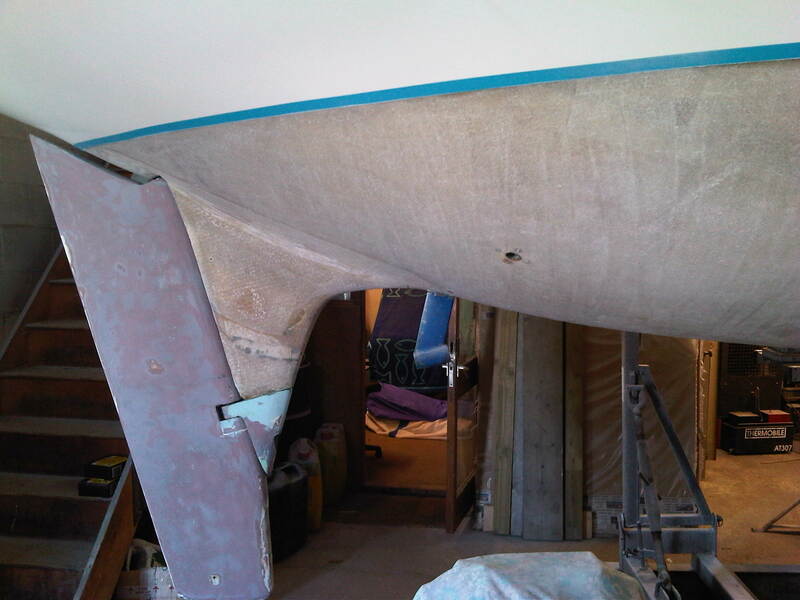 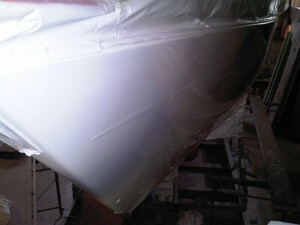 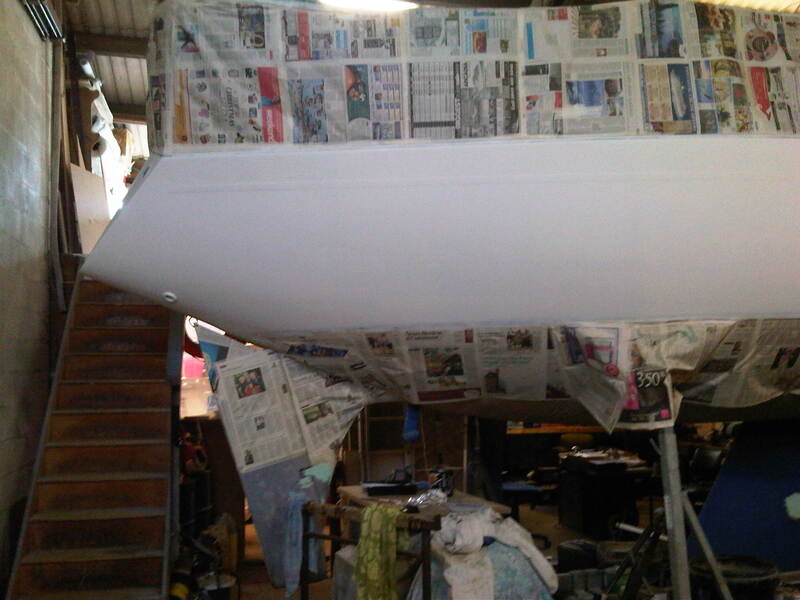 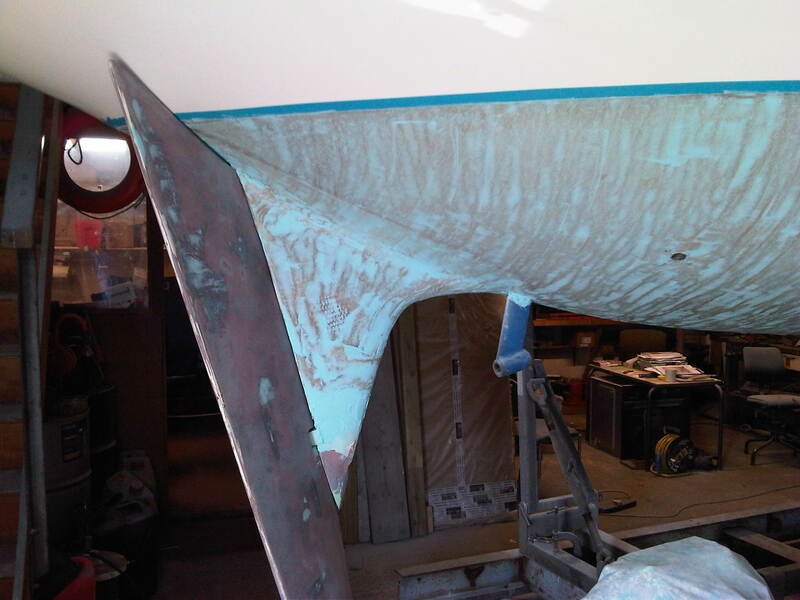 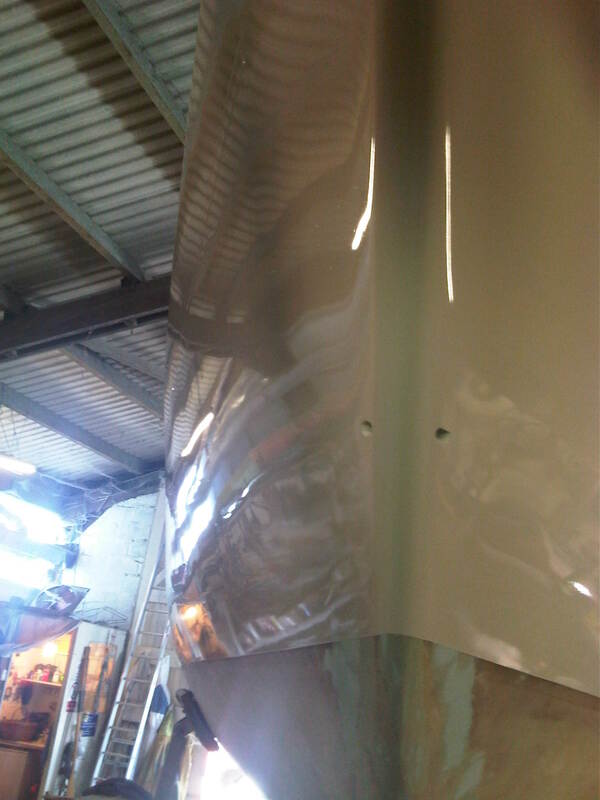 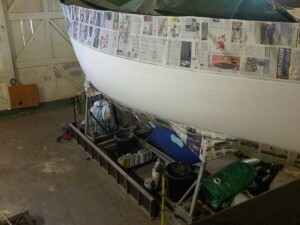 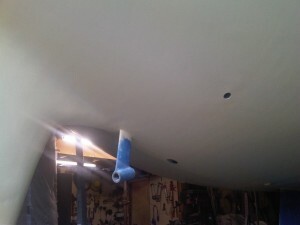 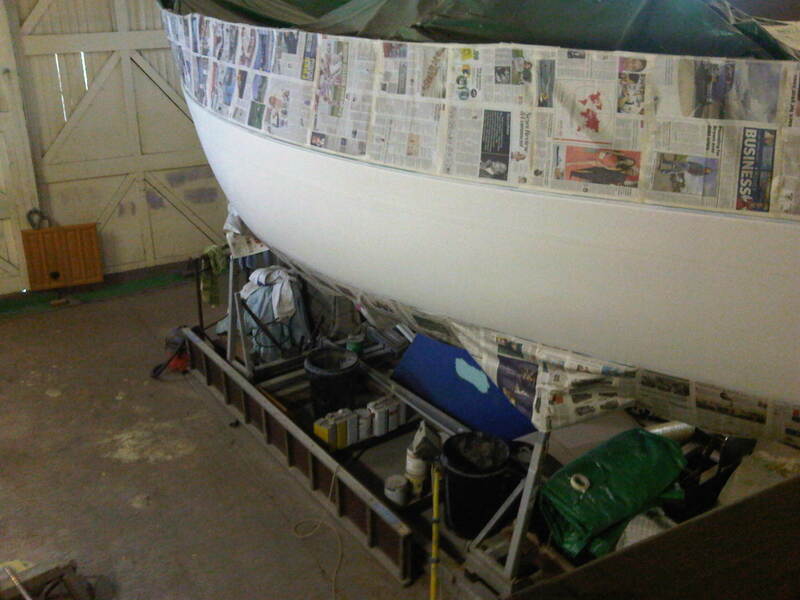 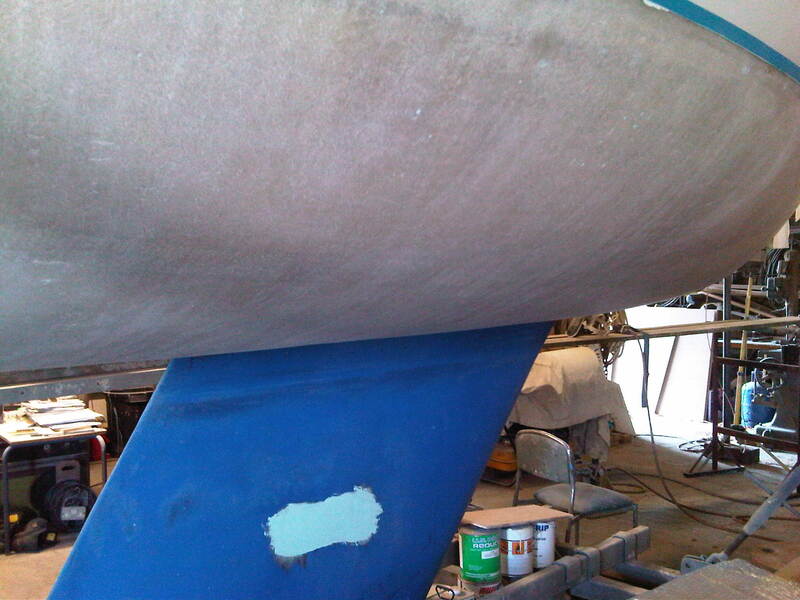 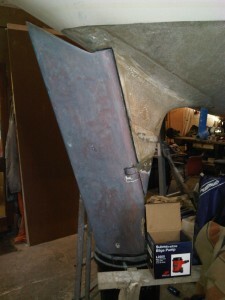 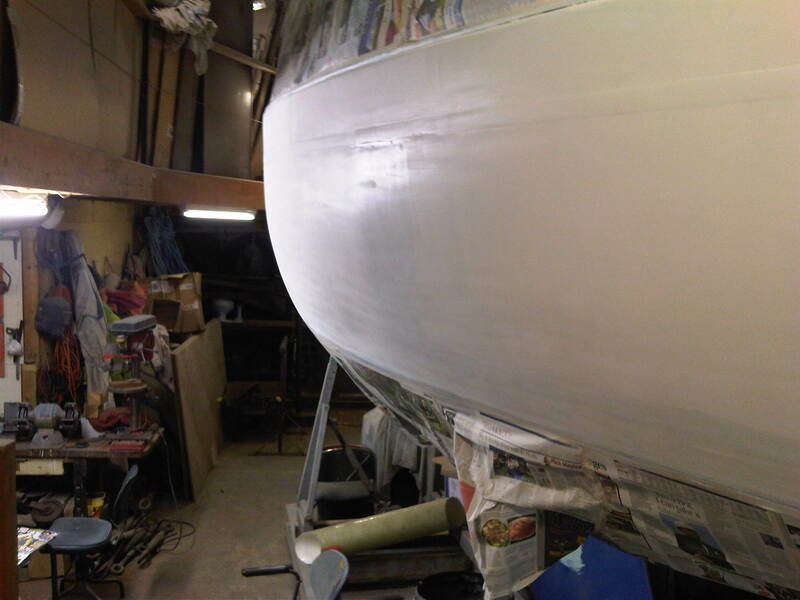 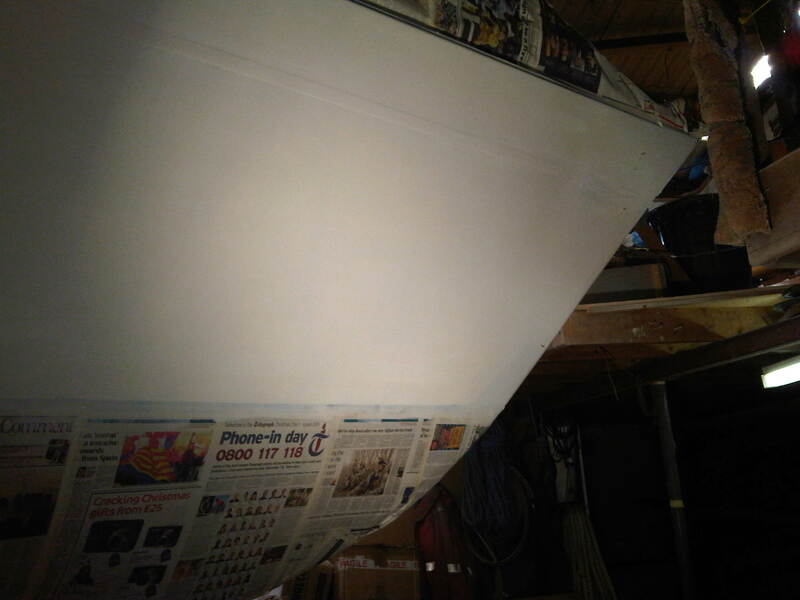 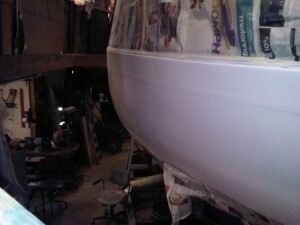 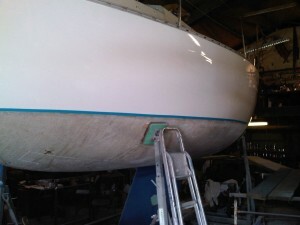 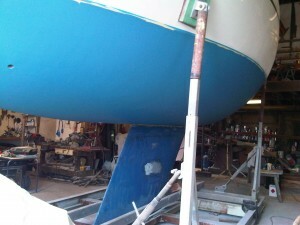 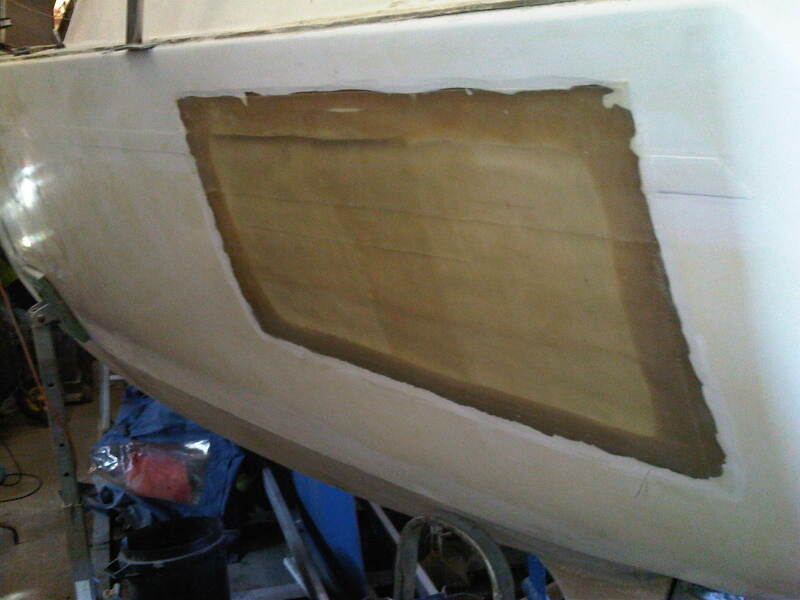 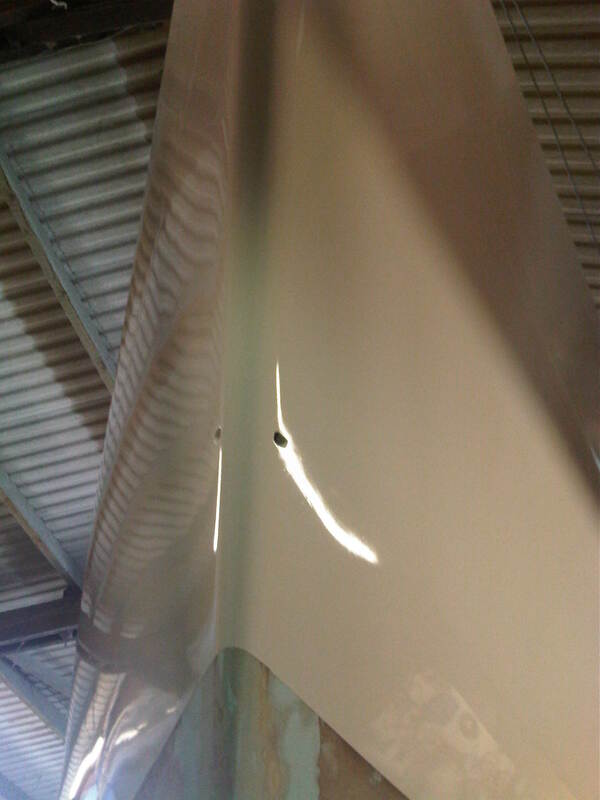 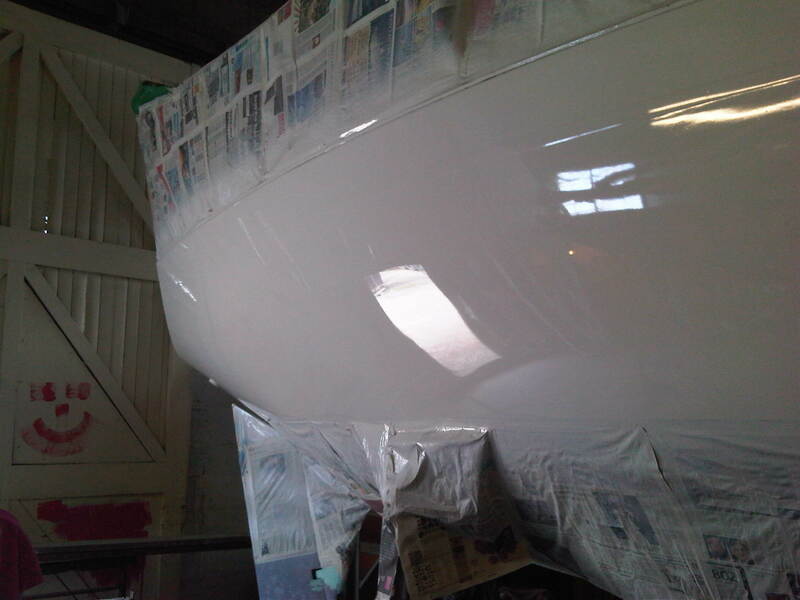 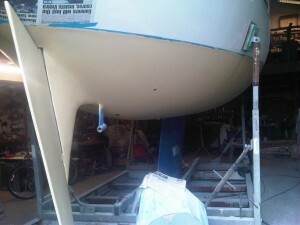 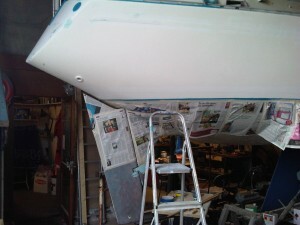 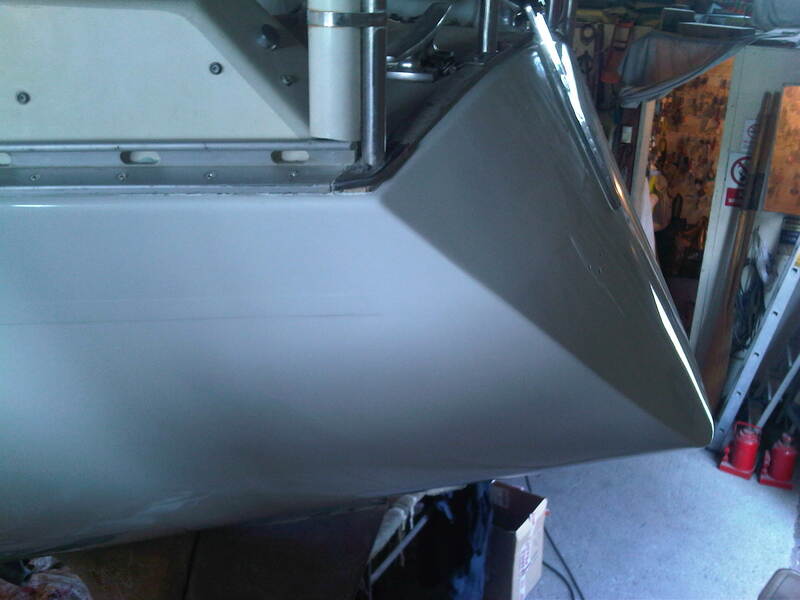 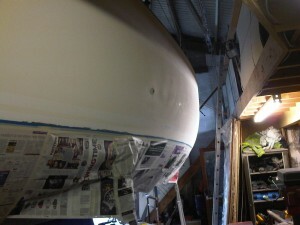 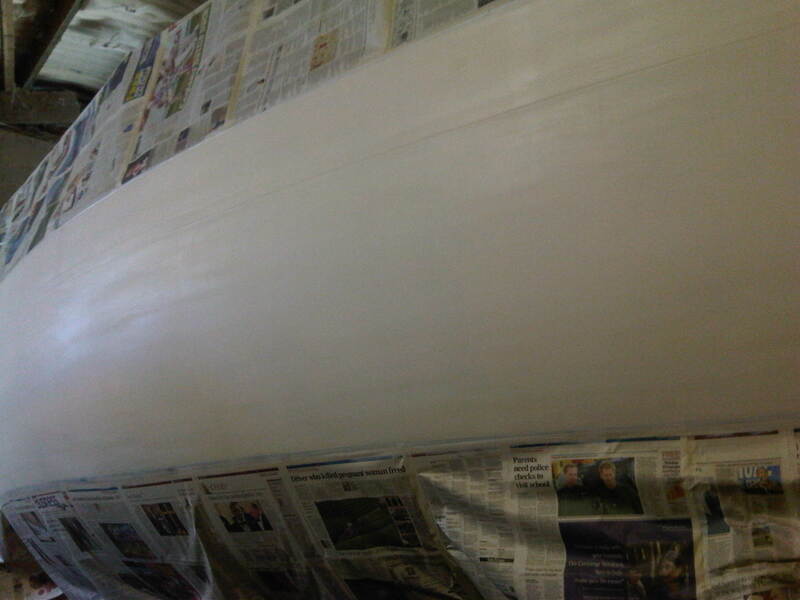 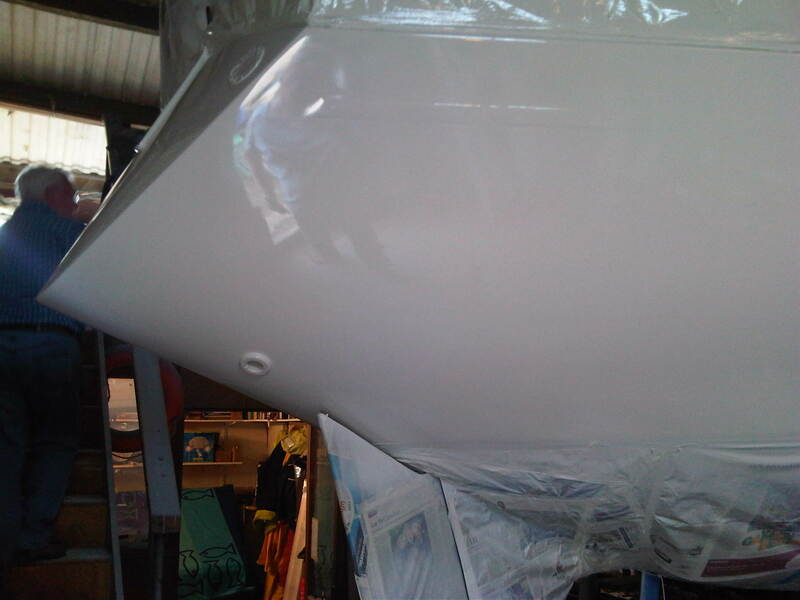 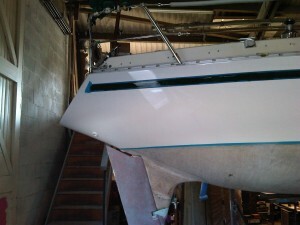 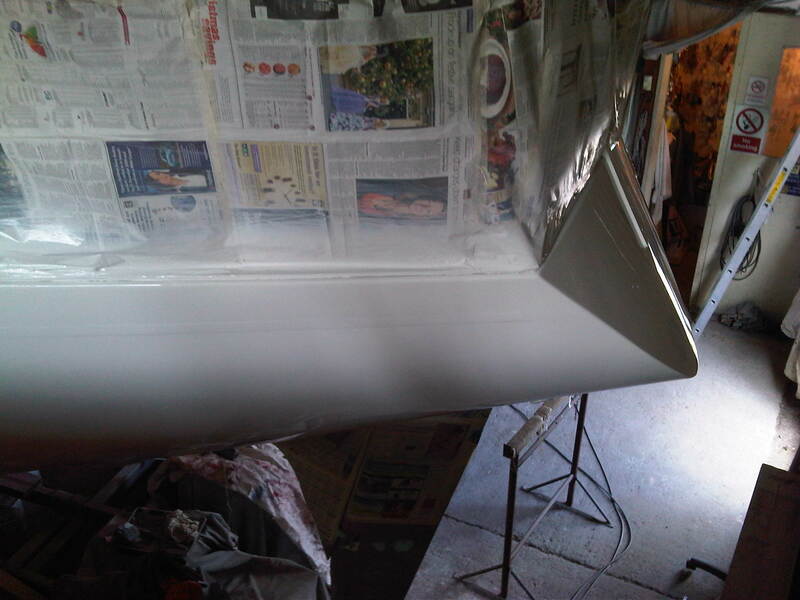 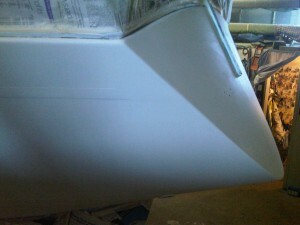 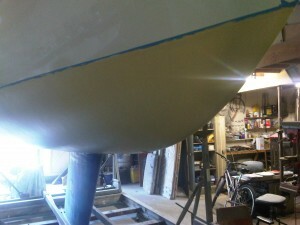 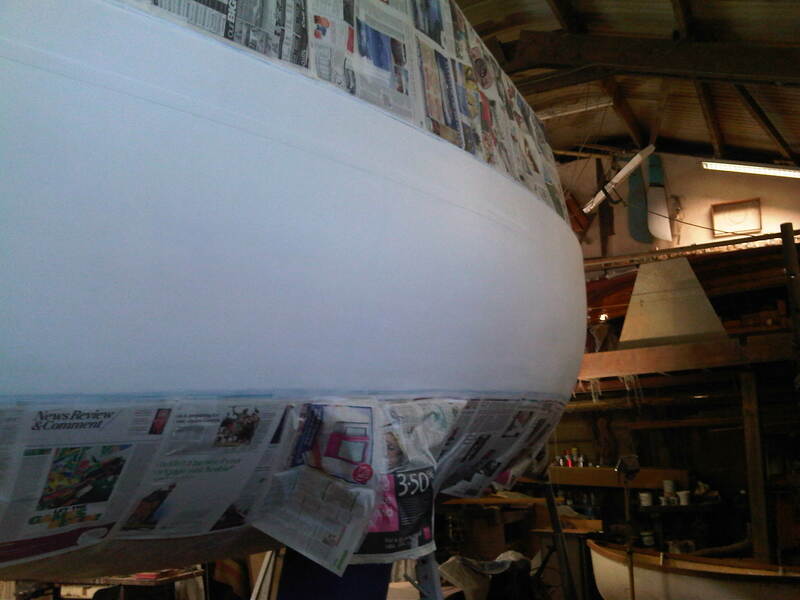 28th June and one coat of ‘hard’ antifoul. At least 6 coats of epoxy. 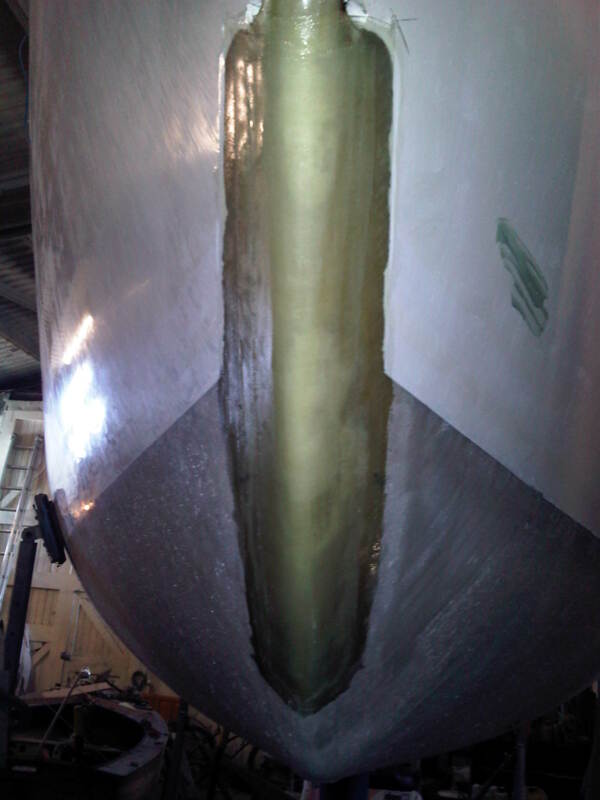 Jack Stay strong points, track stops removed and re bedded. All stanchion bases removed, cleaned and properly re bedded. 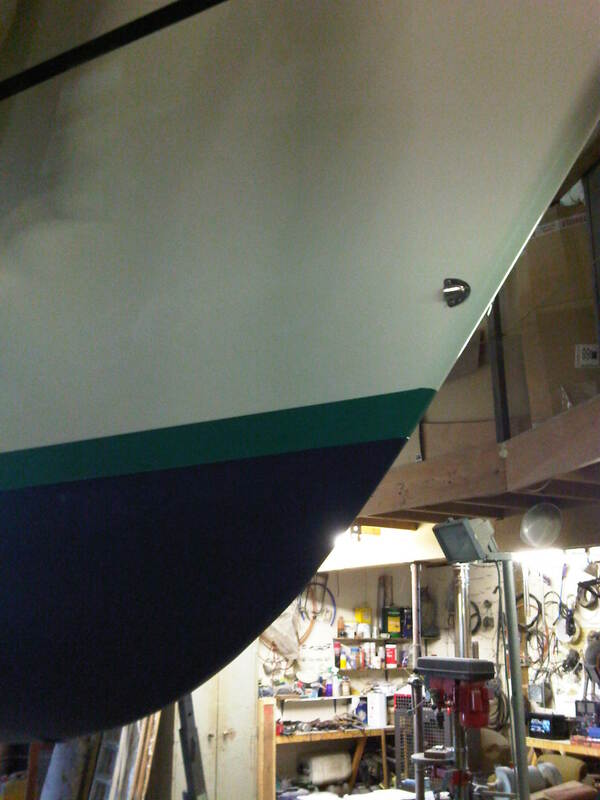 Installation complete. 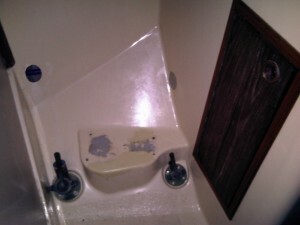 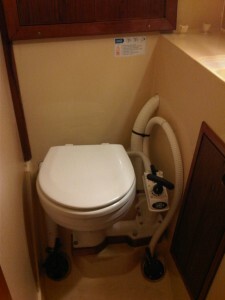 All plumbing has been replaced. 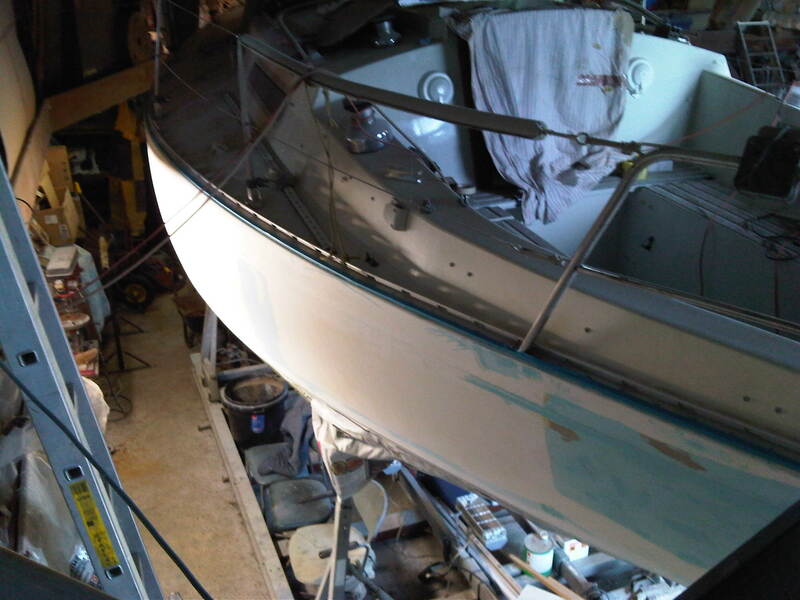 And she’s coming back together down below. The masking tape is off the cove line. 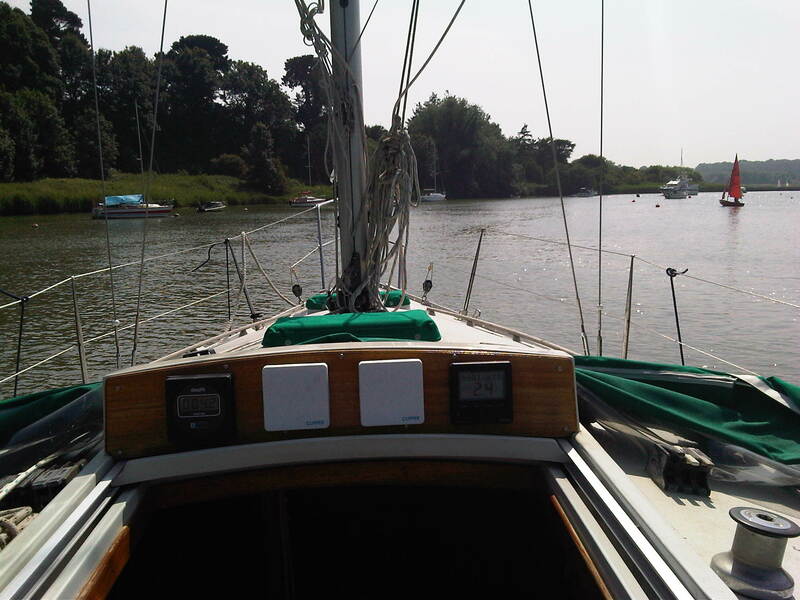 11th June 2013. 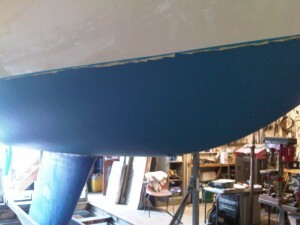 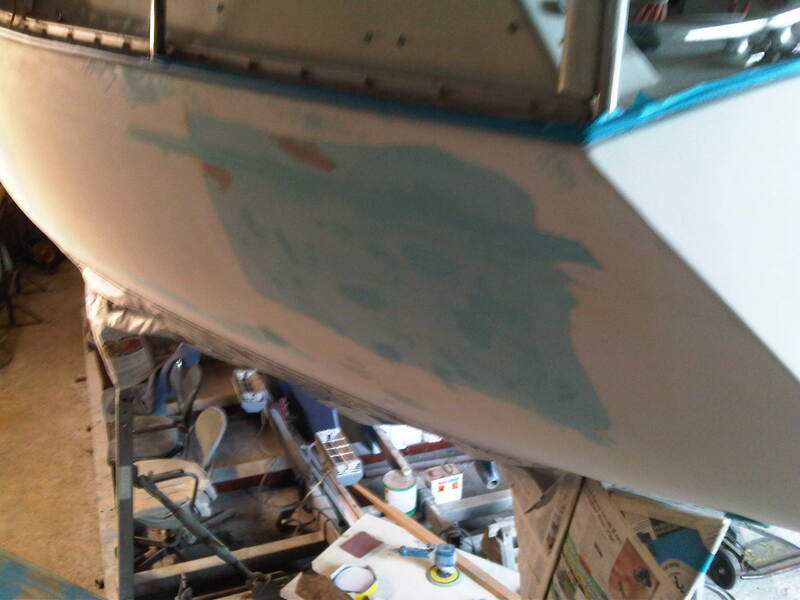 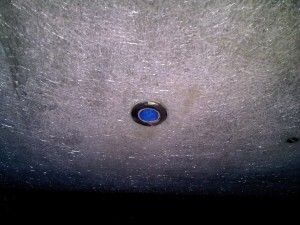 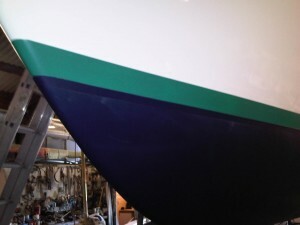 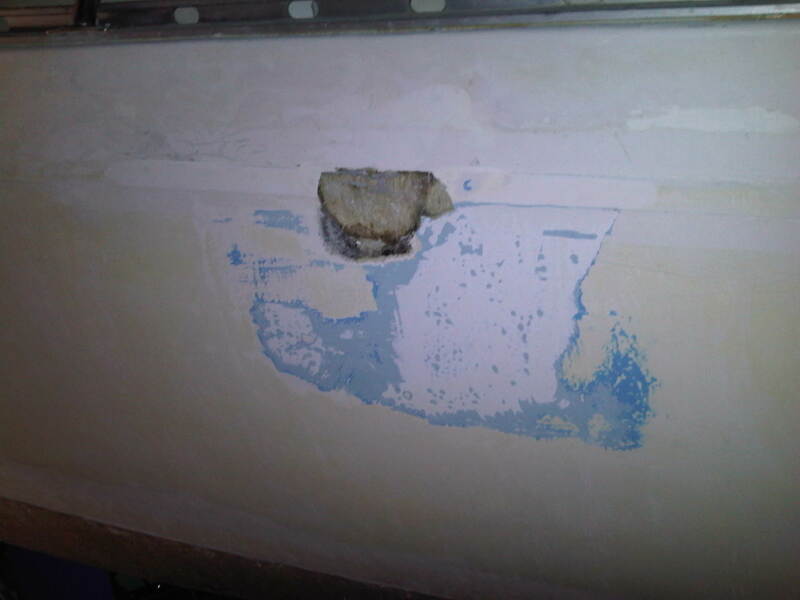 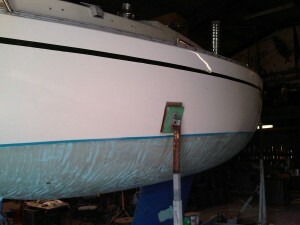 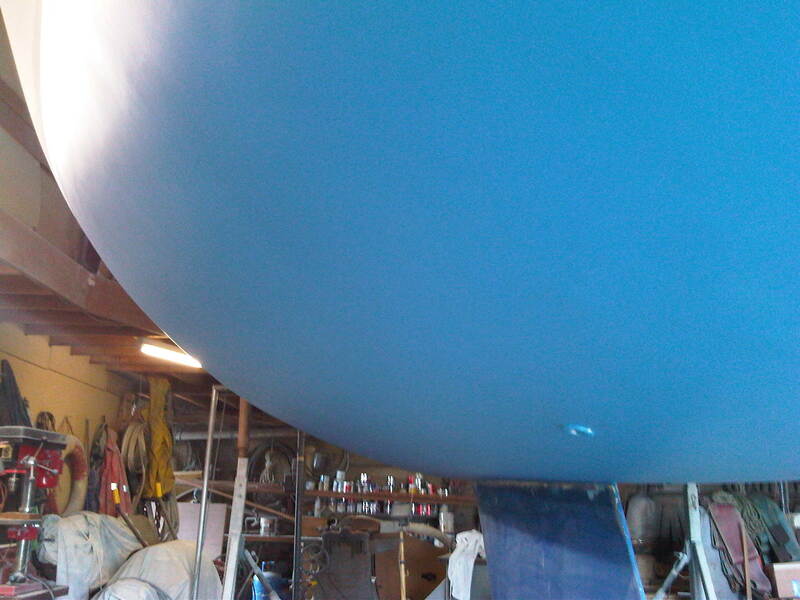 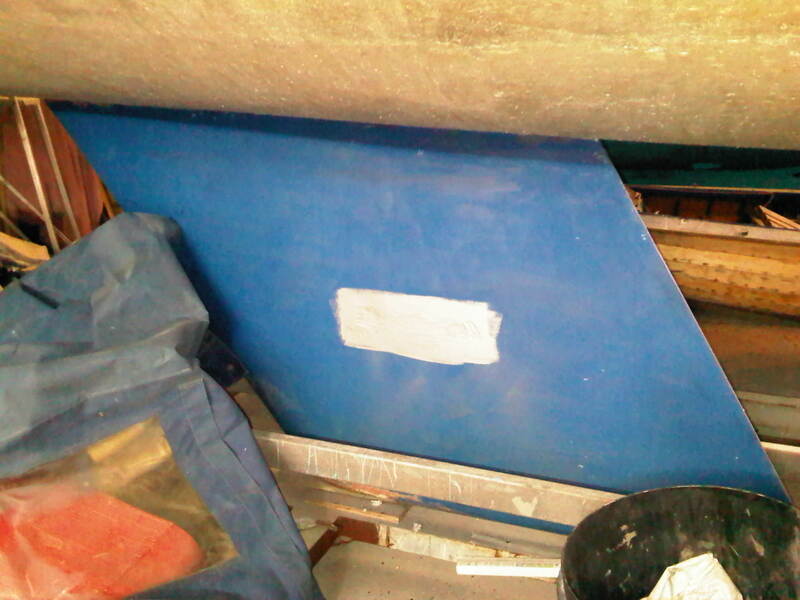 The blue is epoxy filler below the waterline. 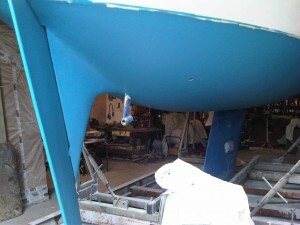 21st May and we are nearly ready to finish below the waterline. 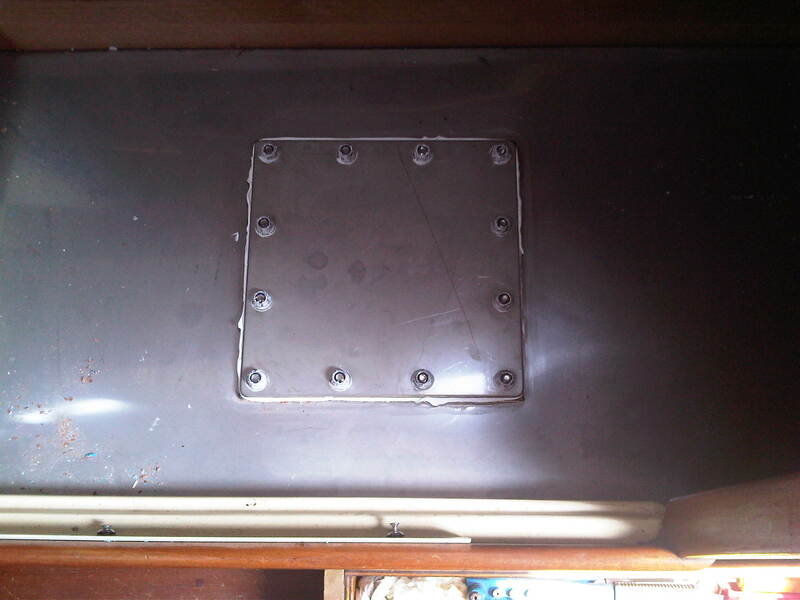 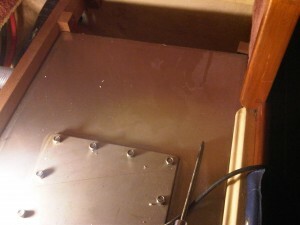 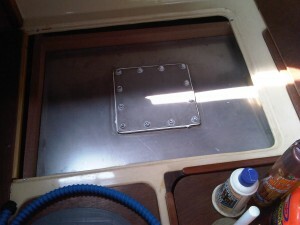 Chain Plates were removed and re bedded with new nuts and bolts. The cover is off the top and work can continue on deck and down below. 2013 8th May and following the respray the masking tape is finally off. 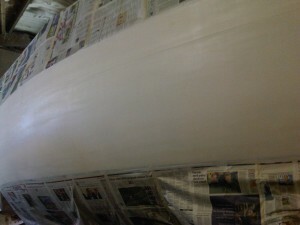 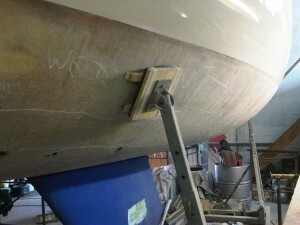 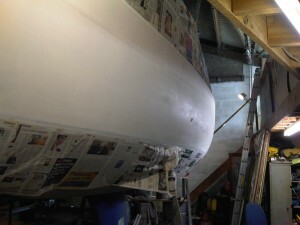 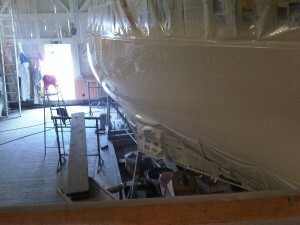 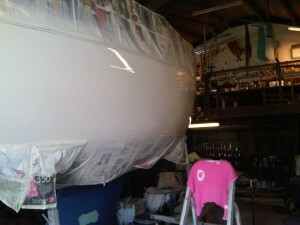 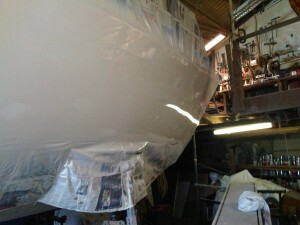 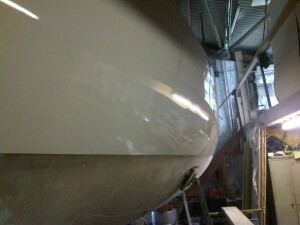 The masking tape will come off on May 8th and she can be completed below the waterline. 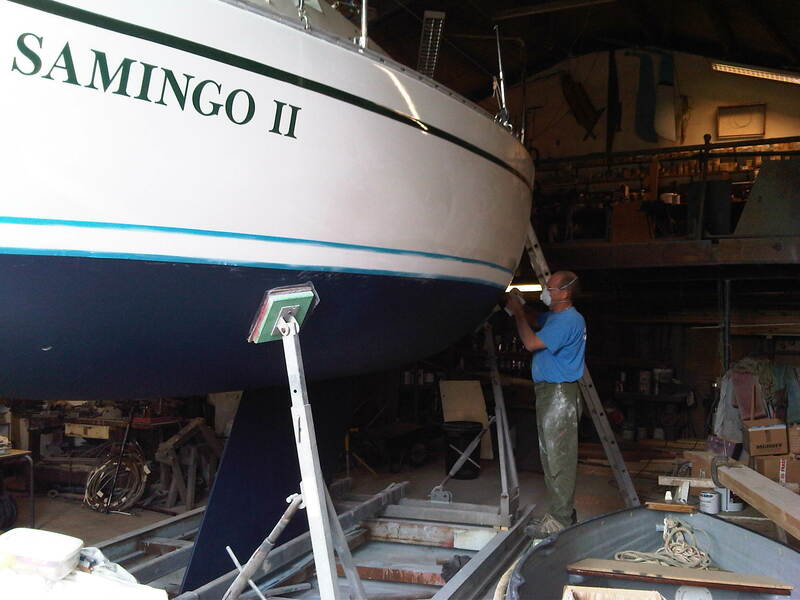 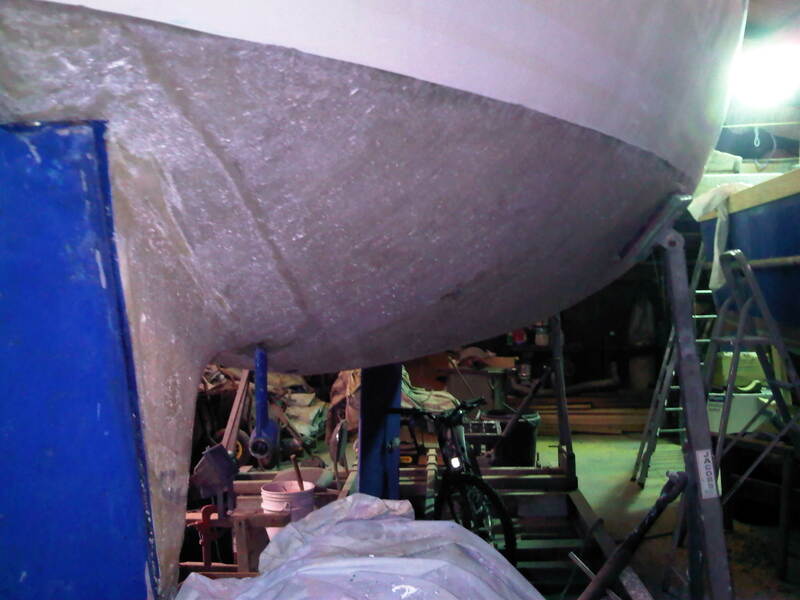 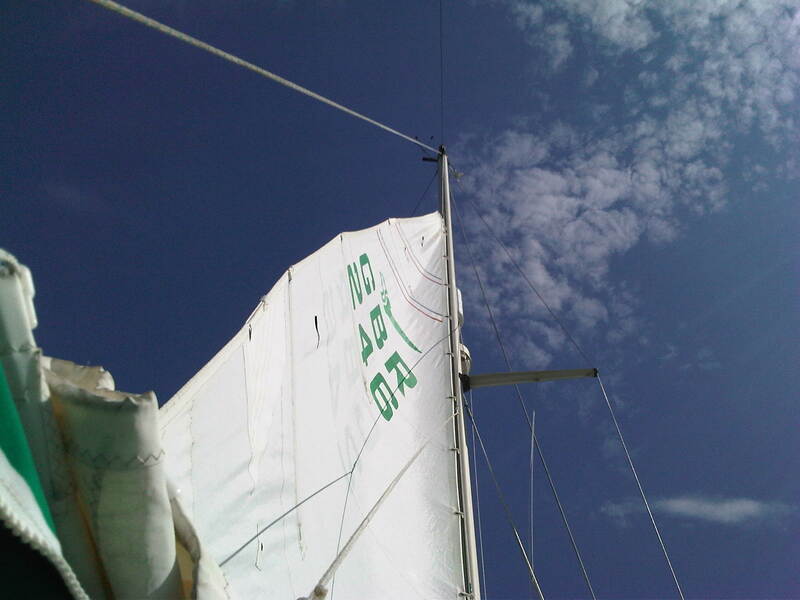 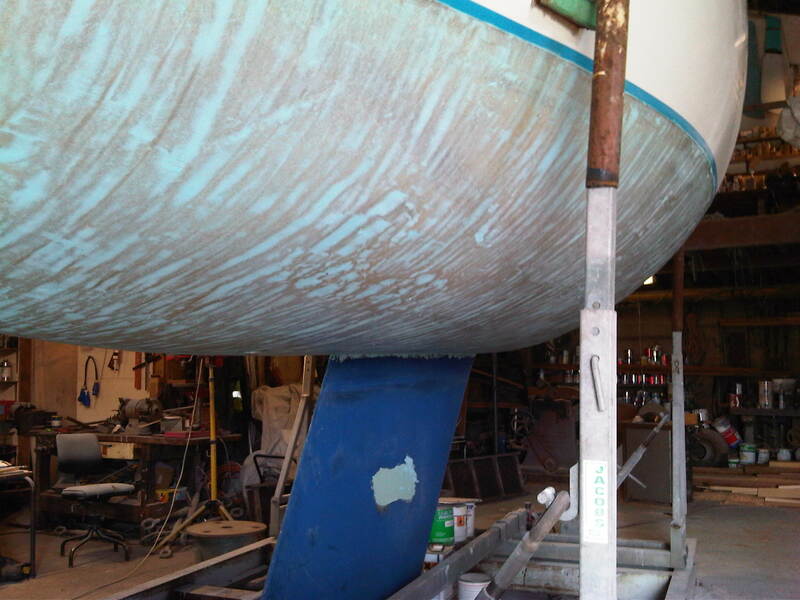 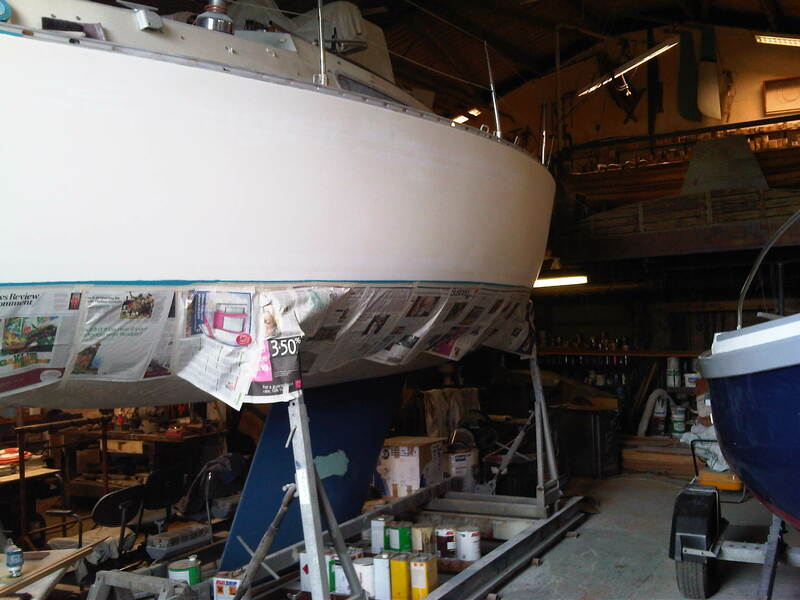 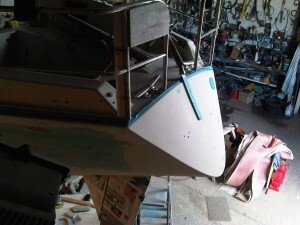 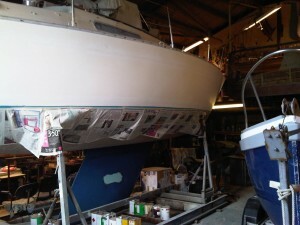 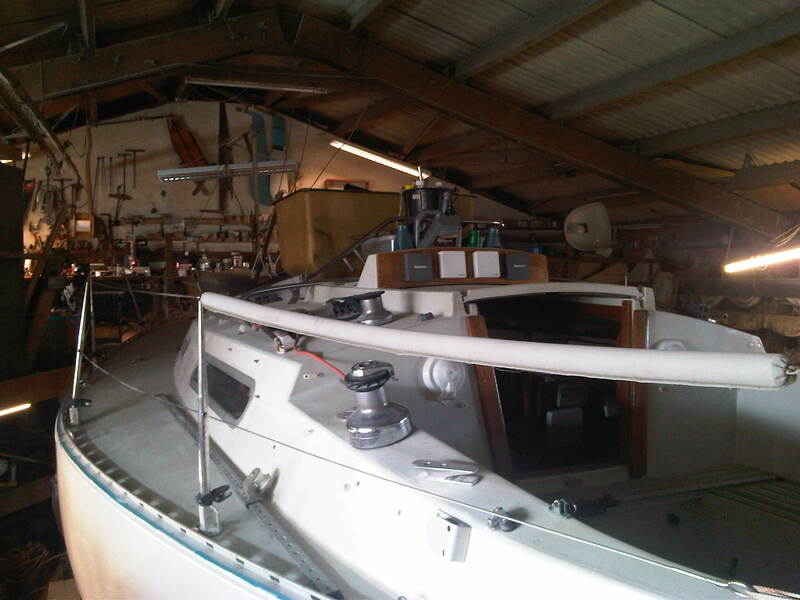 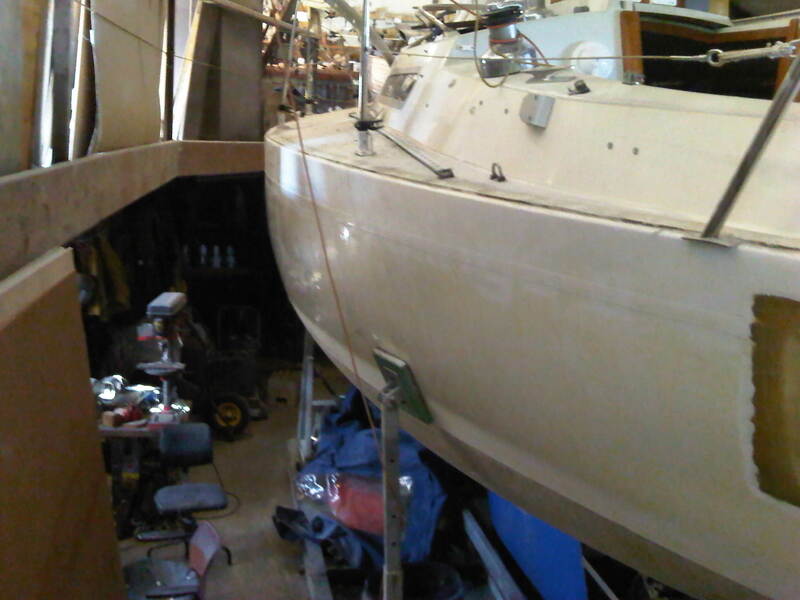 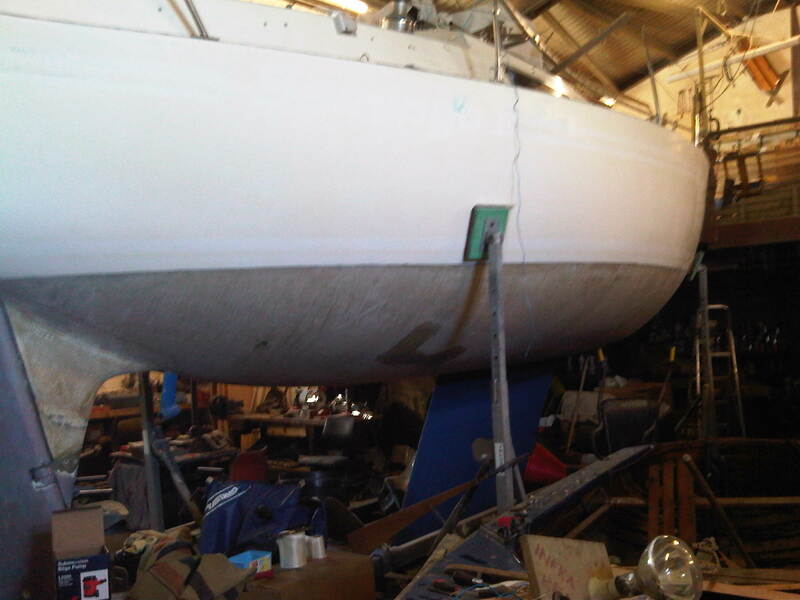 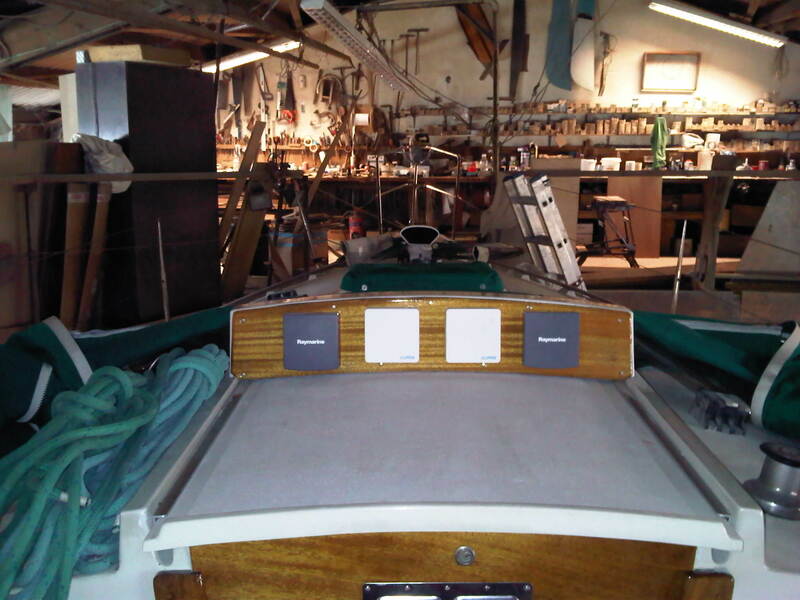 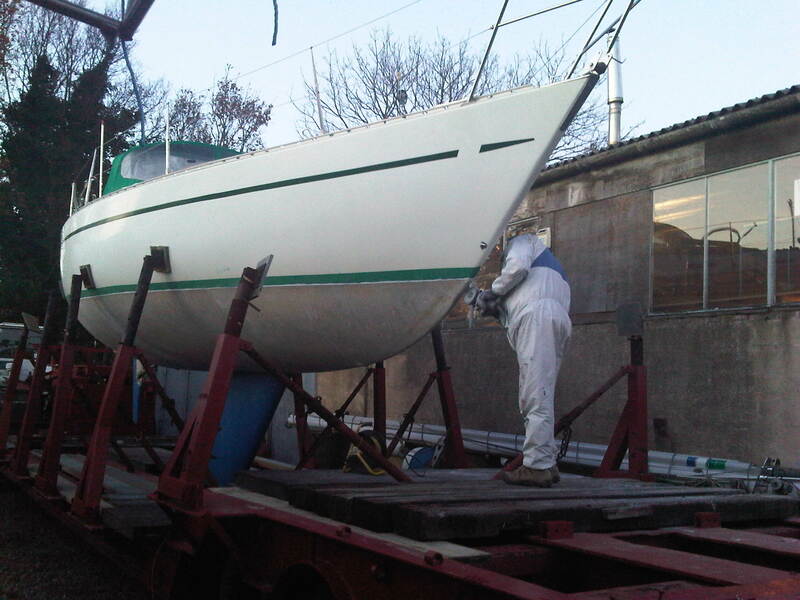 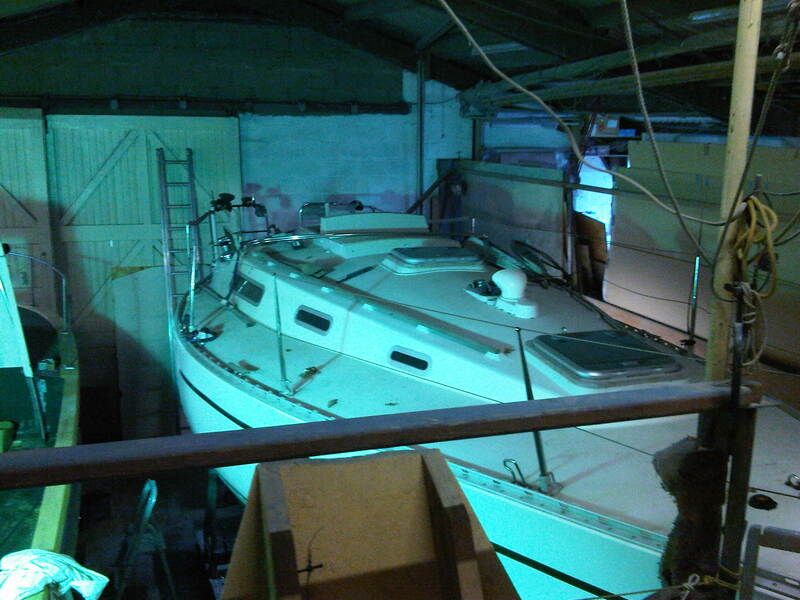 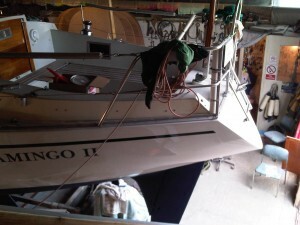 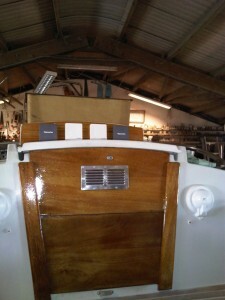 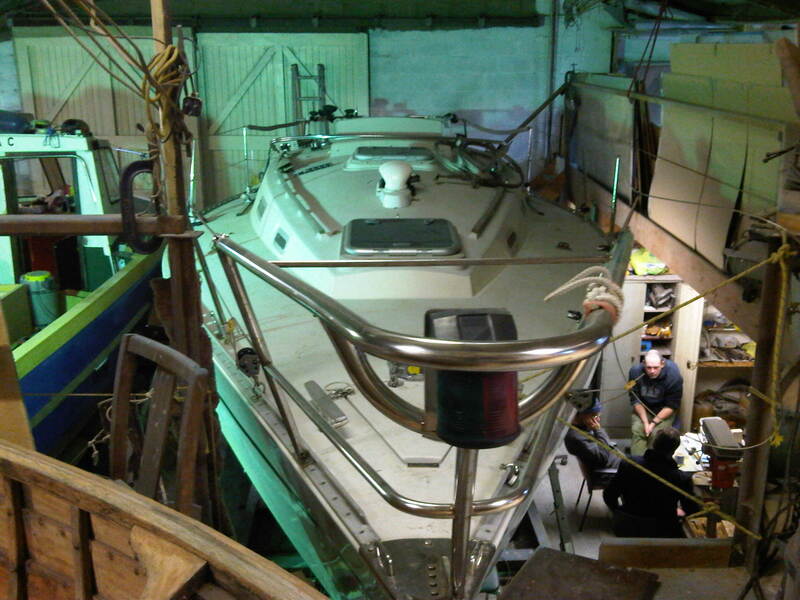 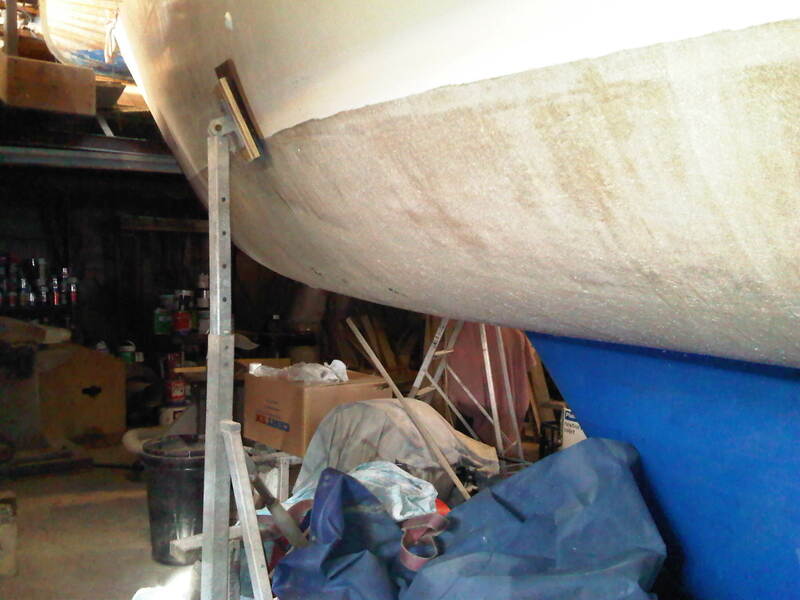 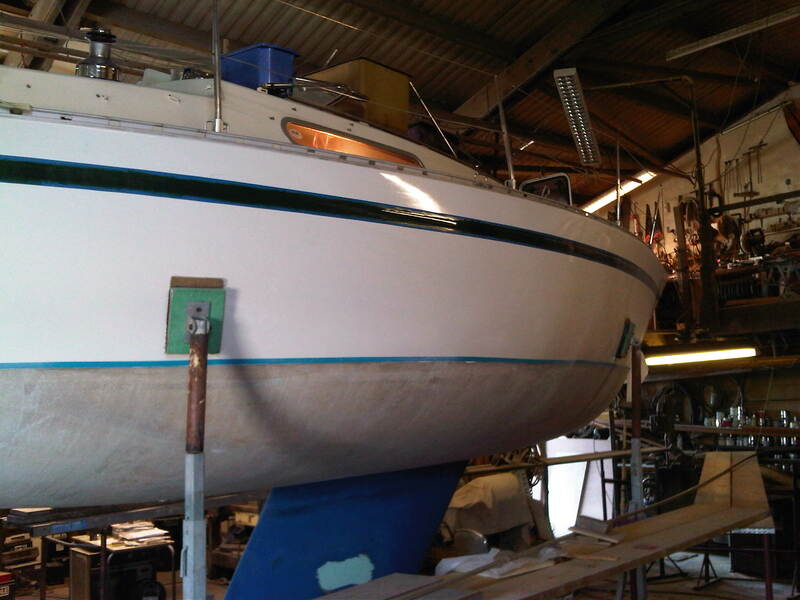 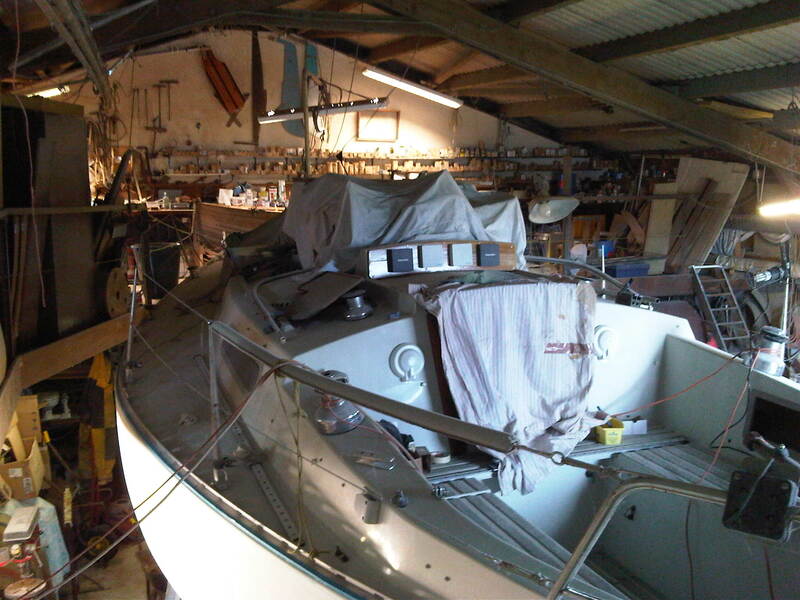 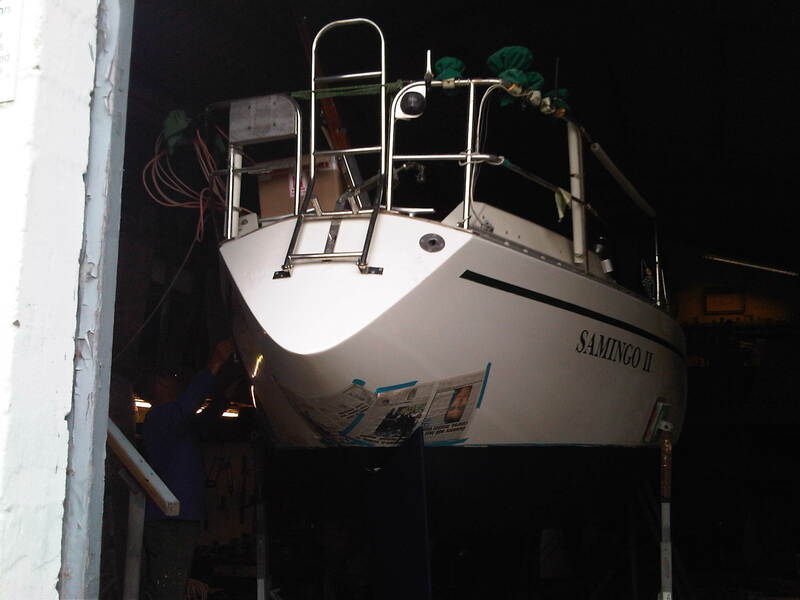 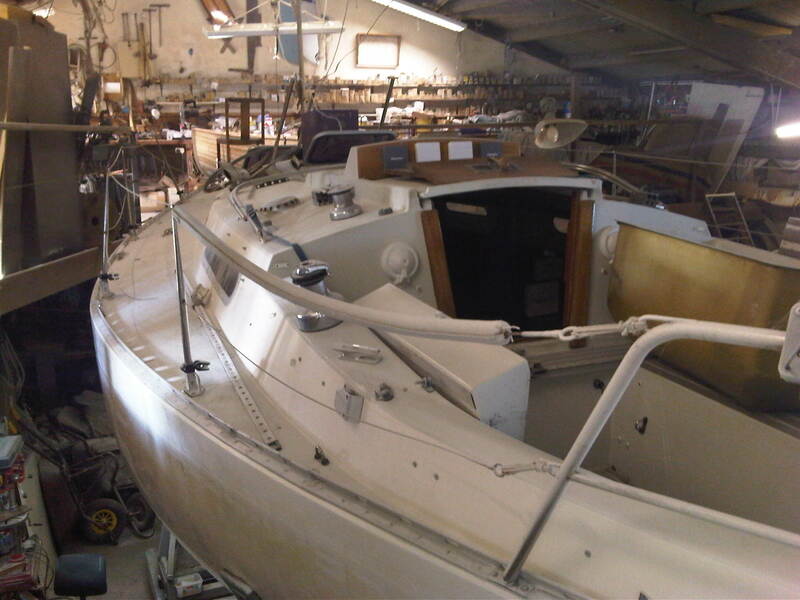 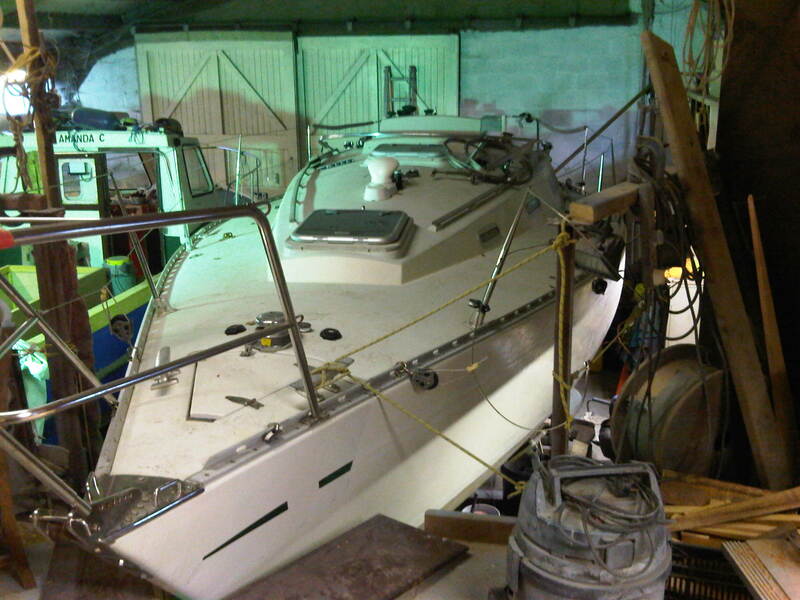 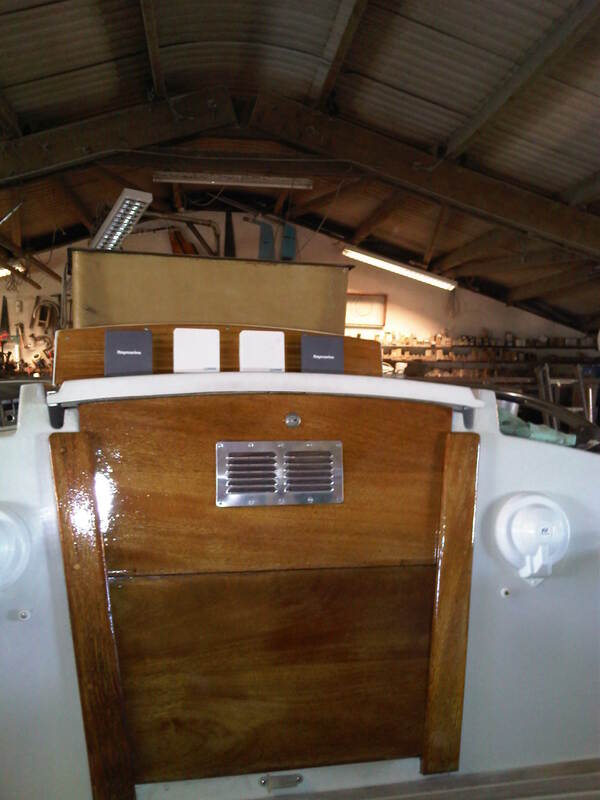 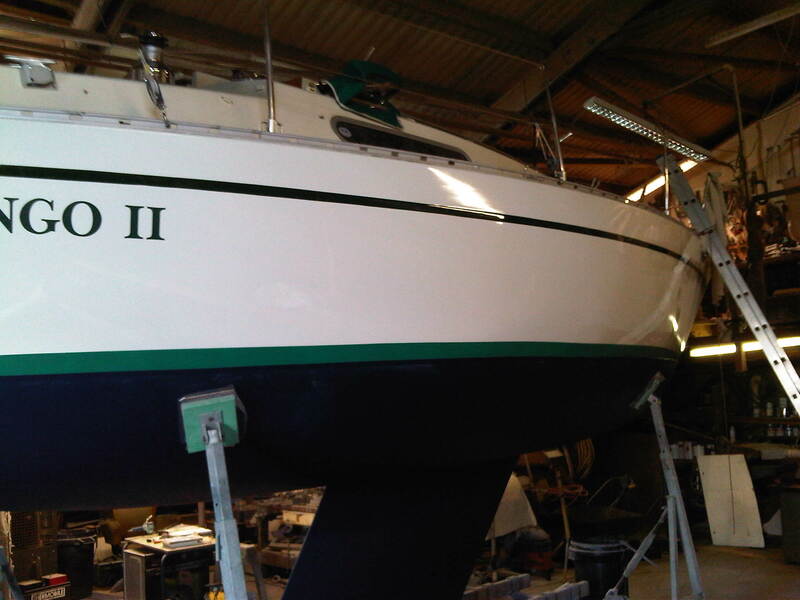 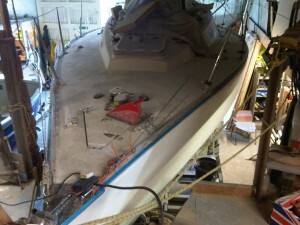 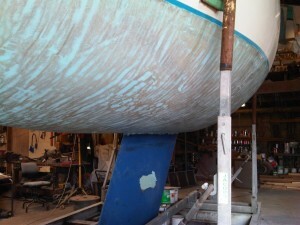 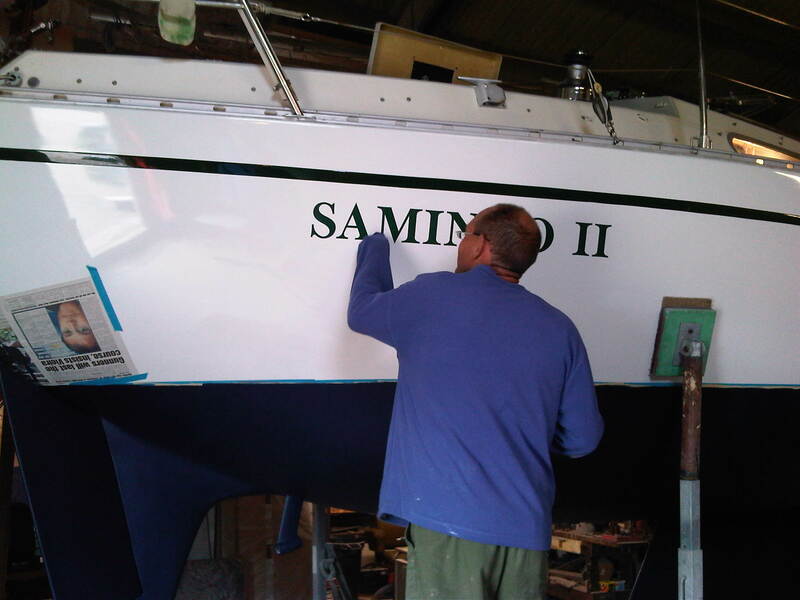 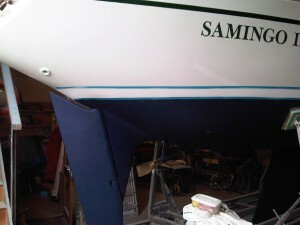 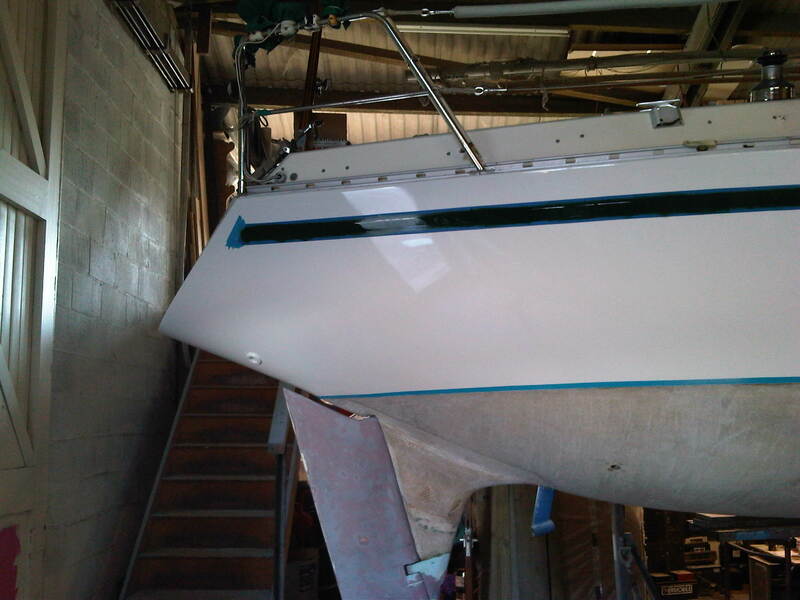 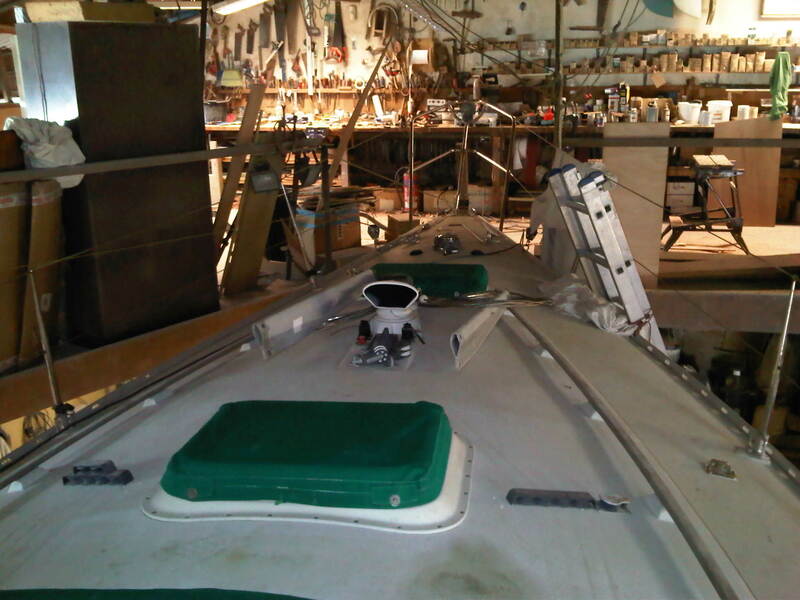 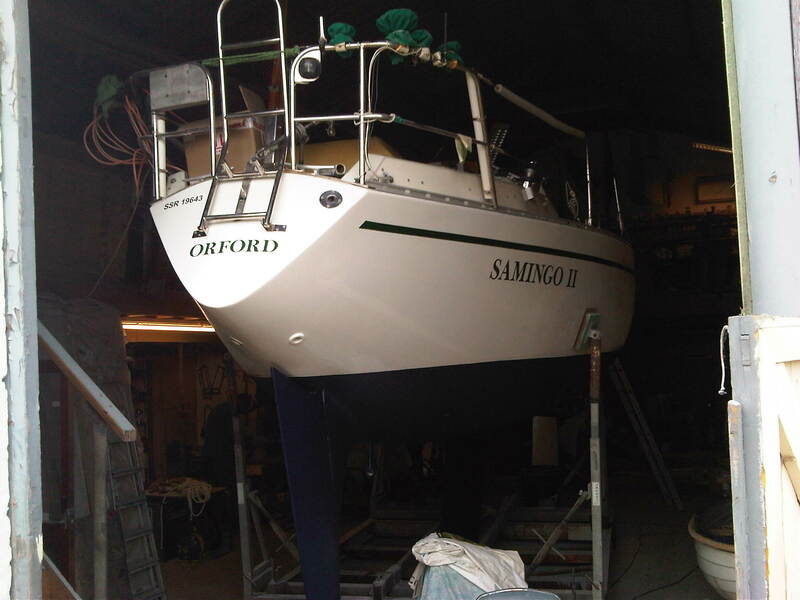 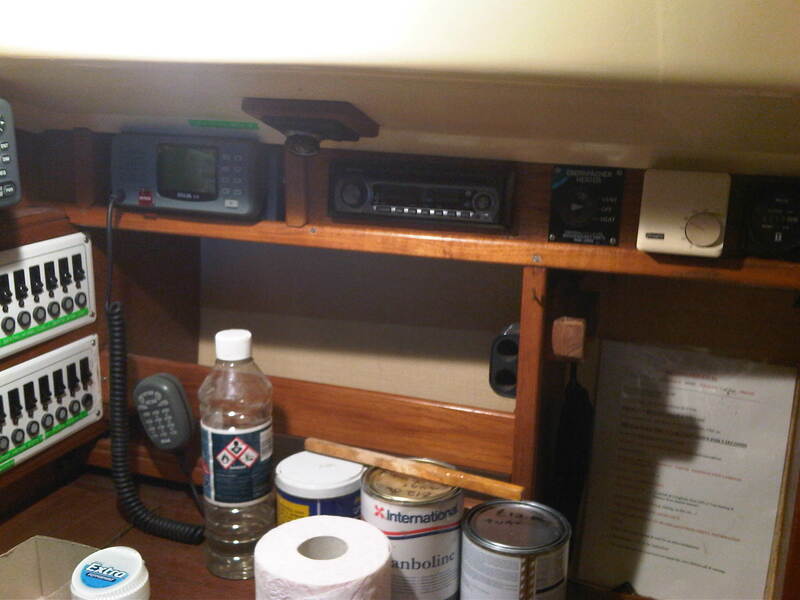 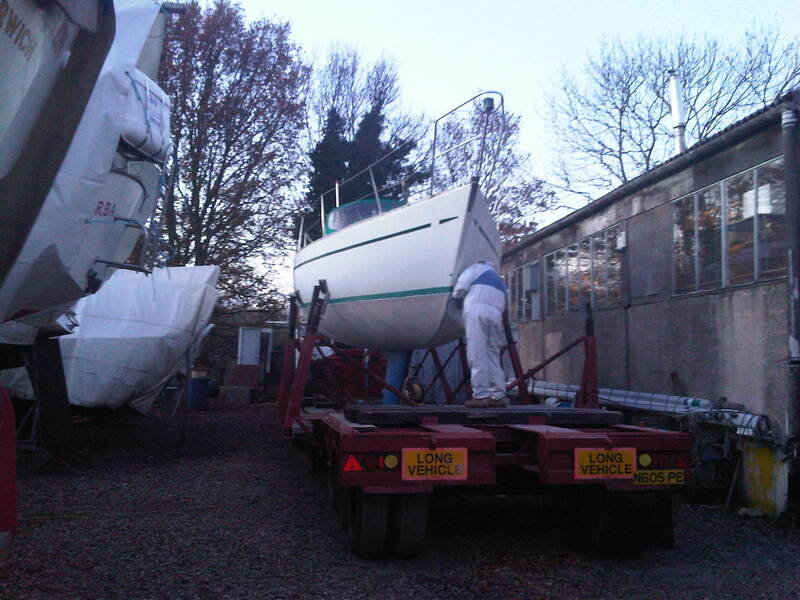 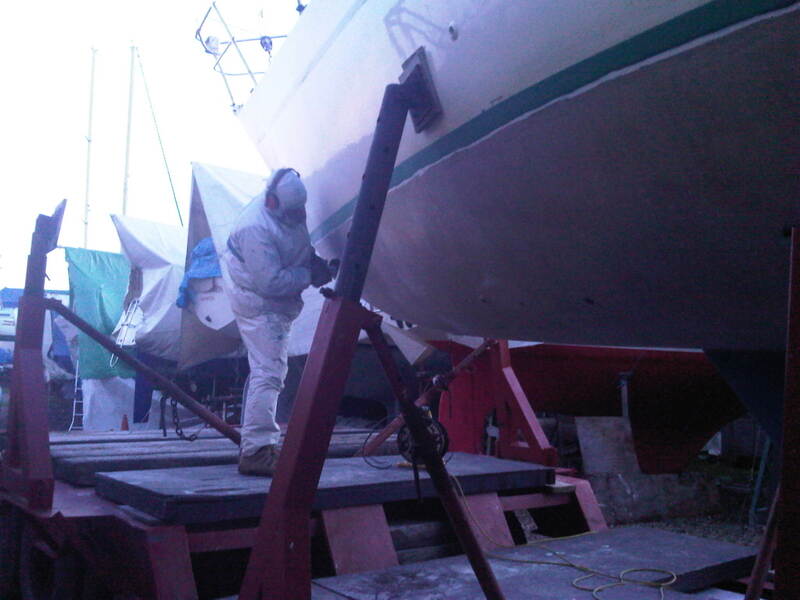 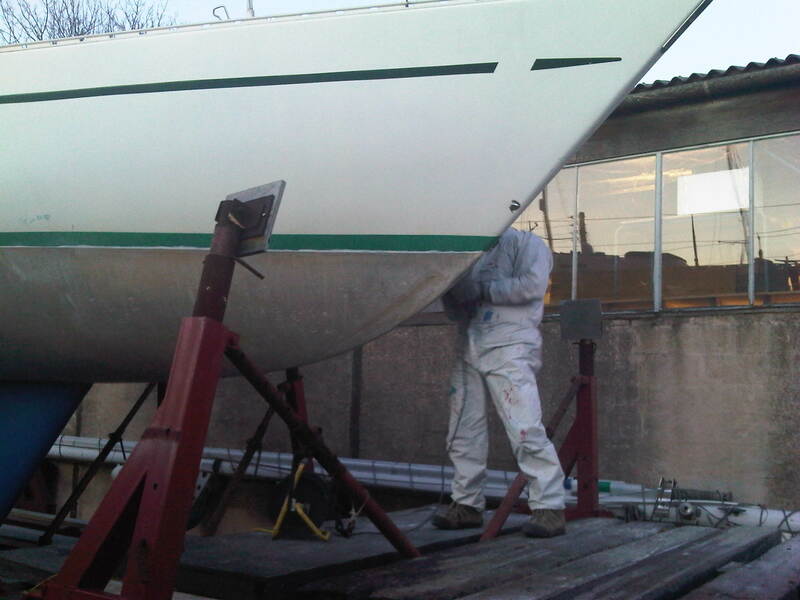 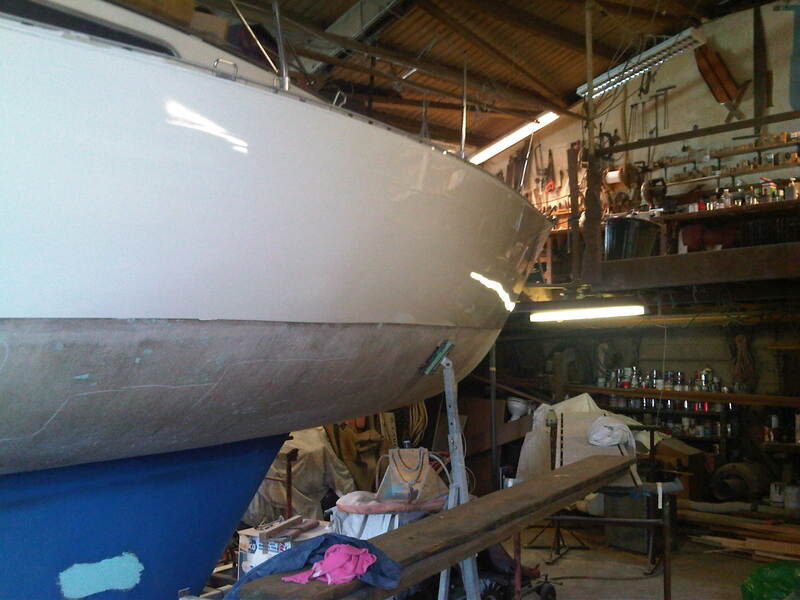 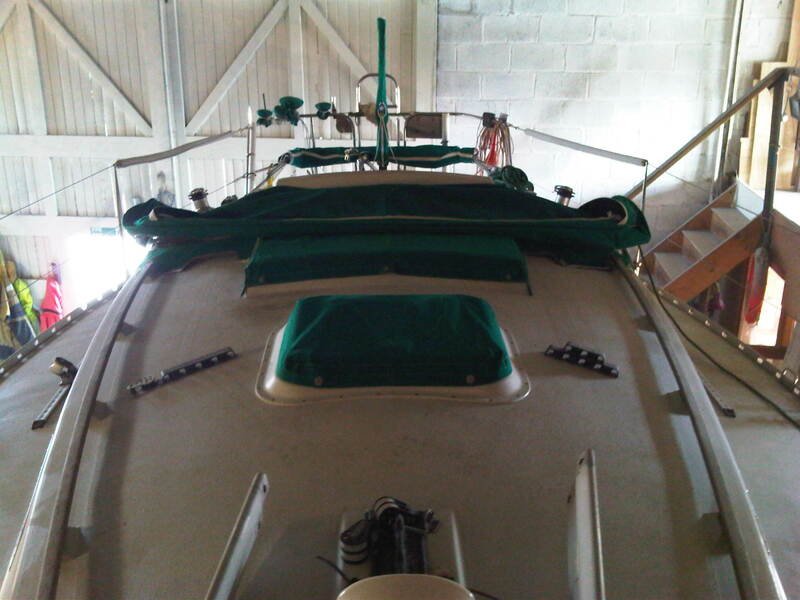 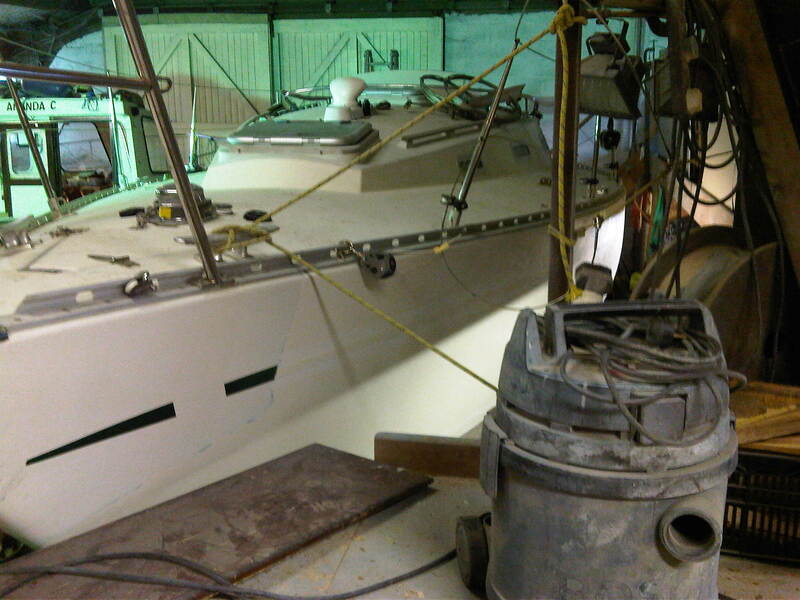 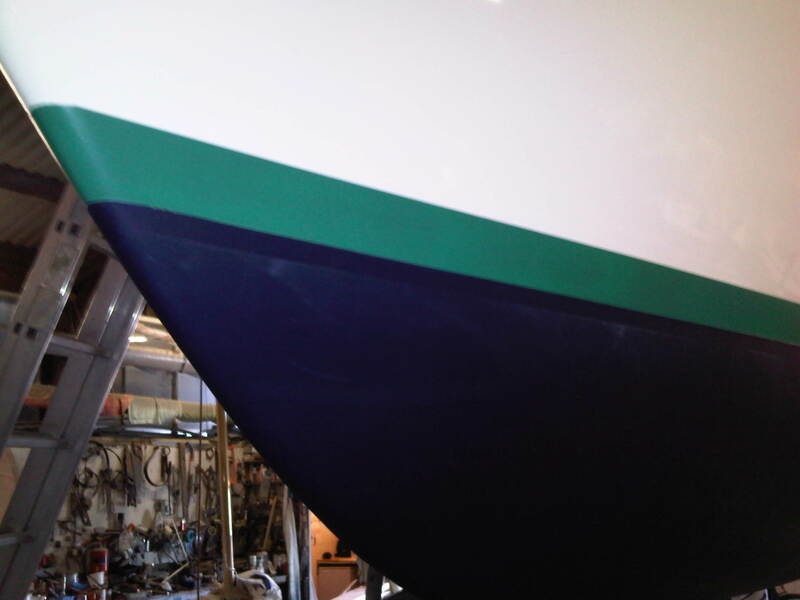 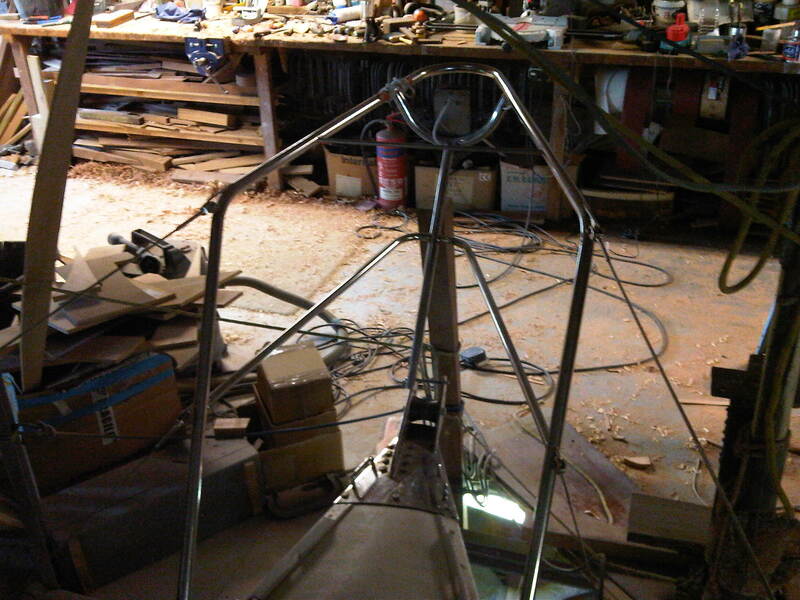 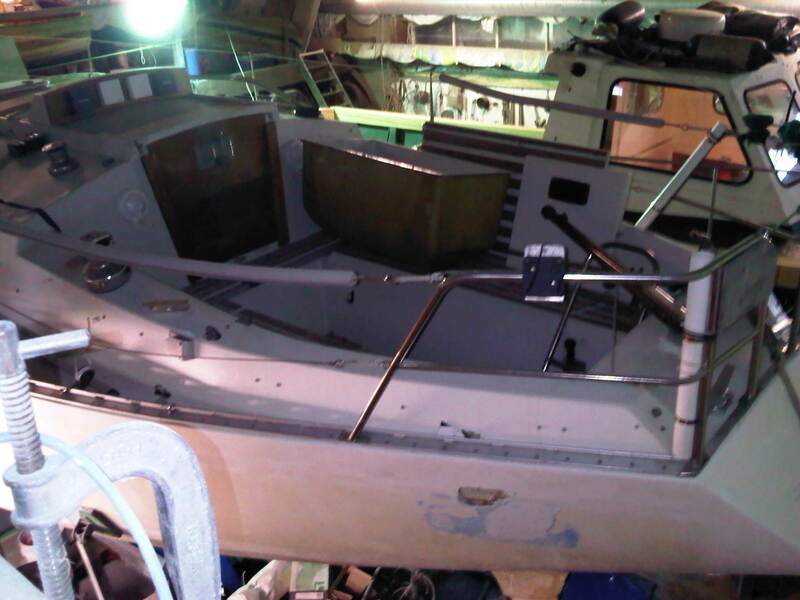 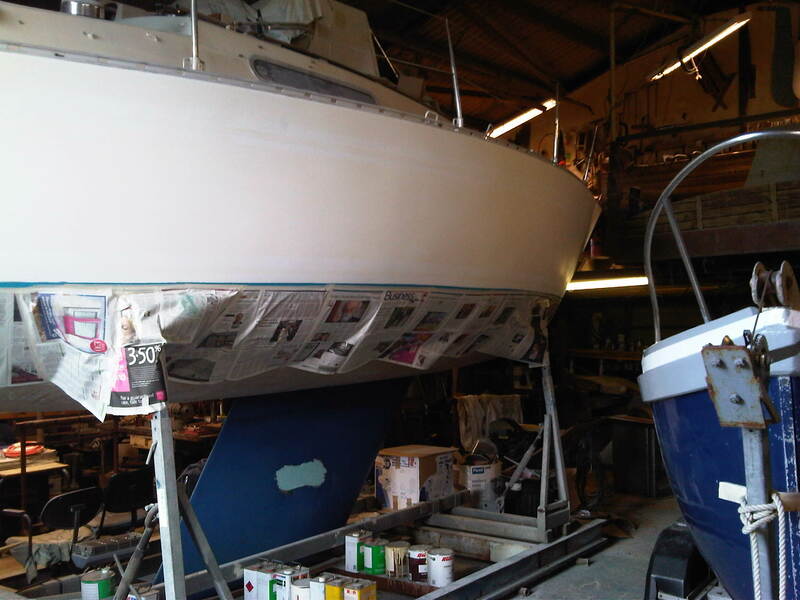 Still lots to do but Samingo ll will sail in 2013 …. Insha’Allah. May 6th 2013 and finally the Top Sides are done. 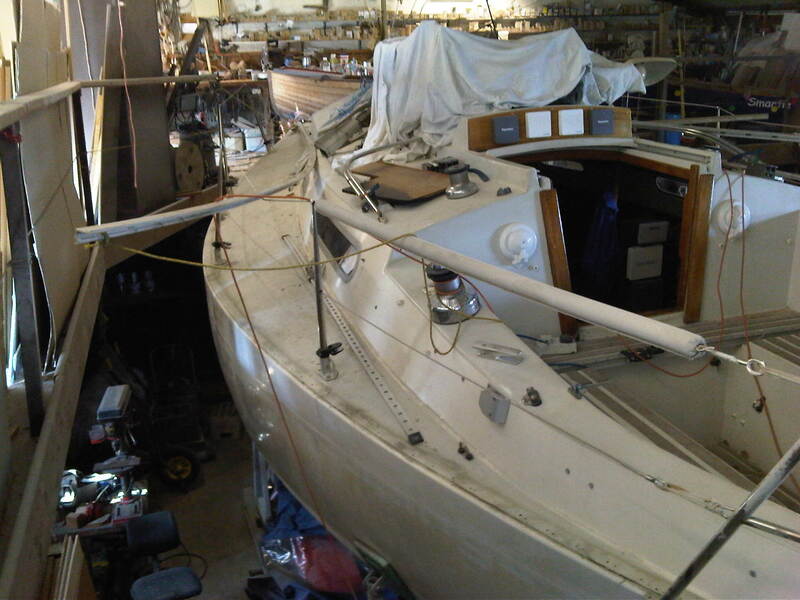 March 2013. 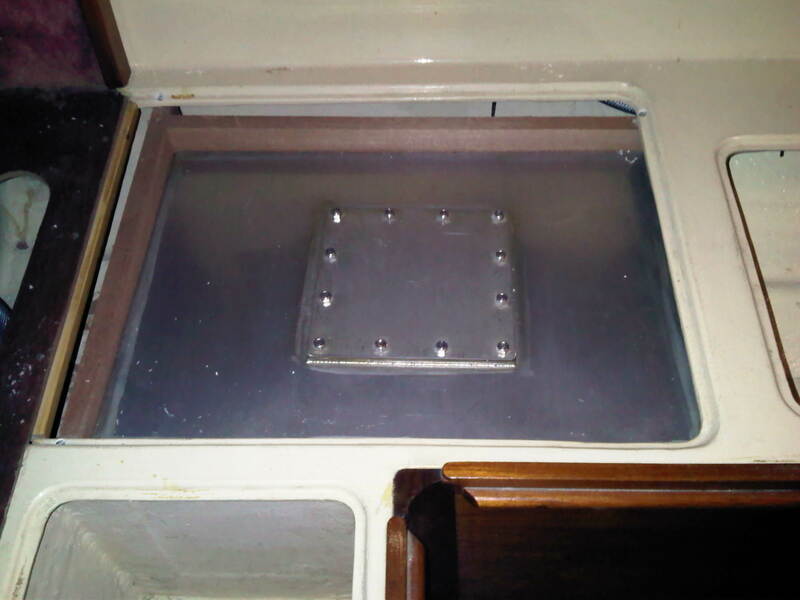 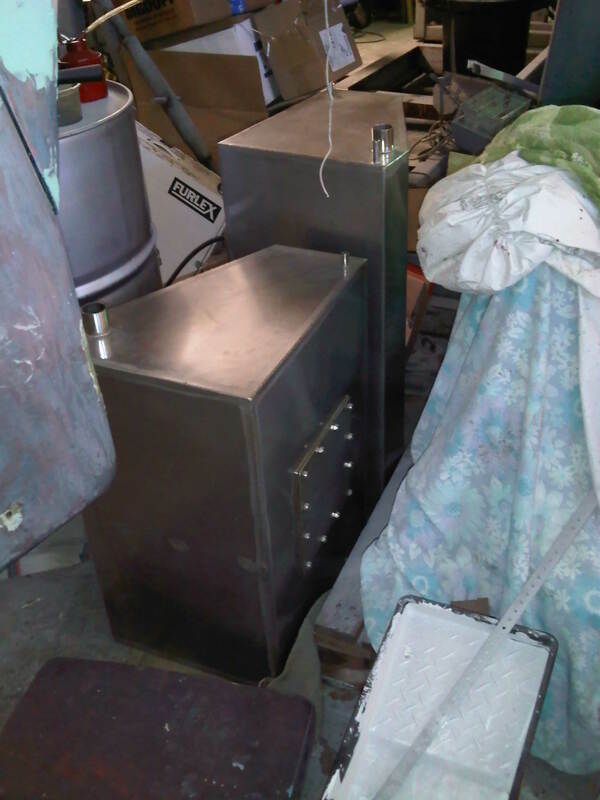 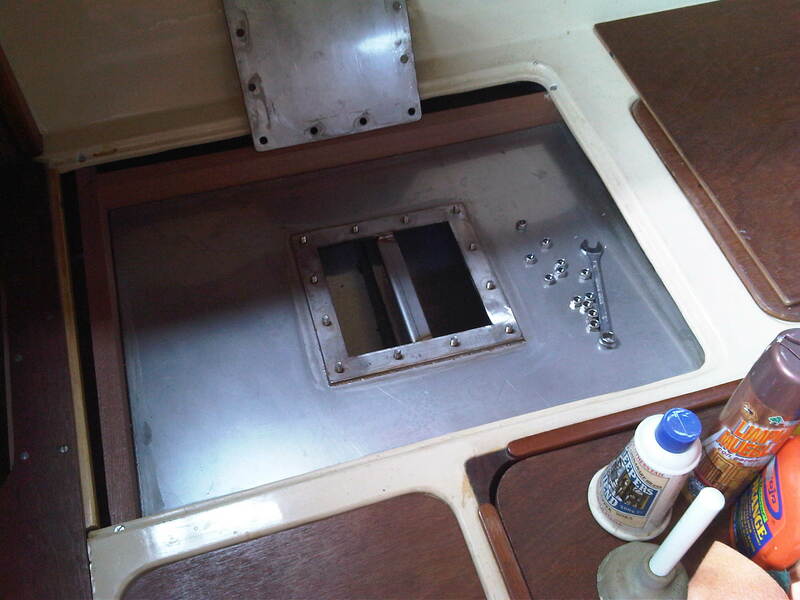 Samingo ll has two new stainless steel fresh water tanks to replace the bladders. 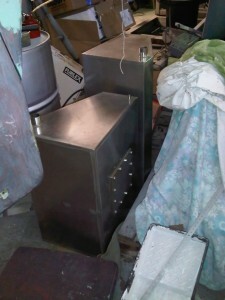 Custom made by the immaculate Kim Tester at Metalfix Rendlesham. 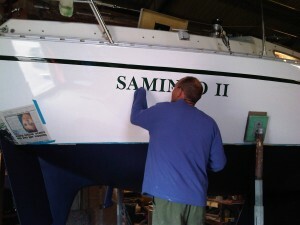 Perfectionist Steve Larkman at work on Samingo ll’s top sides. 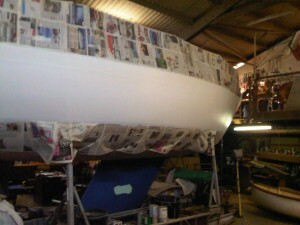 March 2013 and we are nearly there for the top sides. Warmer weather is due…! 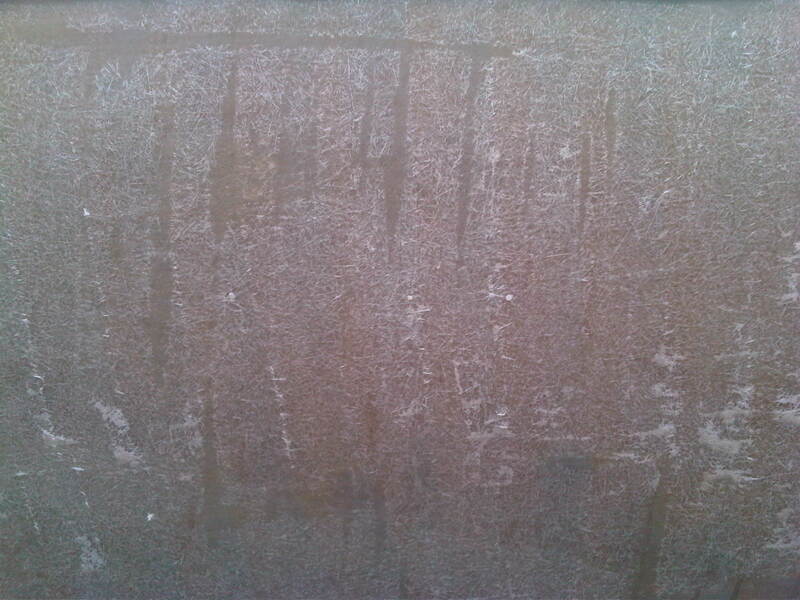 February 2013 and it’s like Siberia outside. February 2013. She’s as dry as she ever will be but it is bitterly cold and Steve cannot spray the top sides. Just as much agony for both of us. Samingo ll has been in the shed for 16 months. 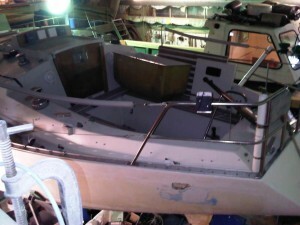 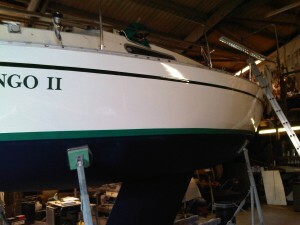 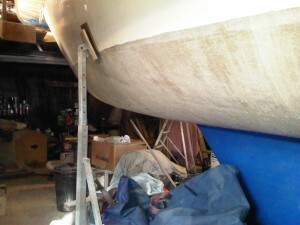 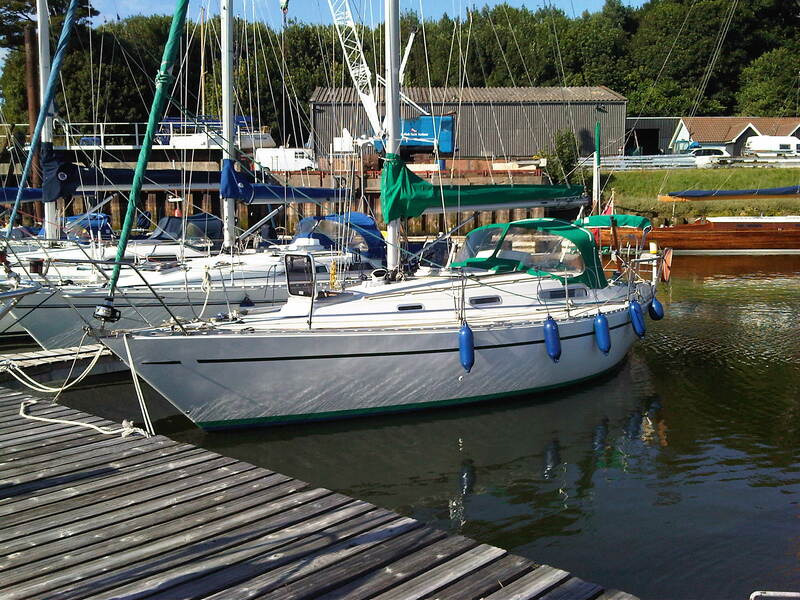 August 2012 at Larkman’s Ltd. Samingo ll will not sail in 2012. 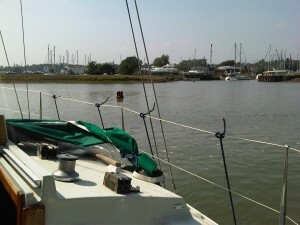 August 2012. 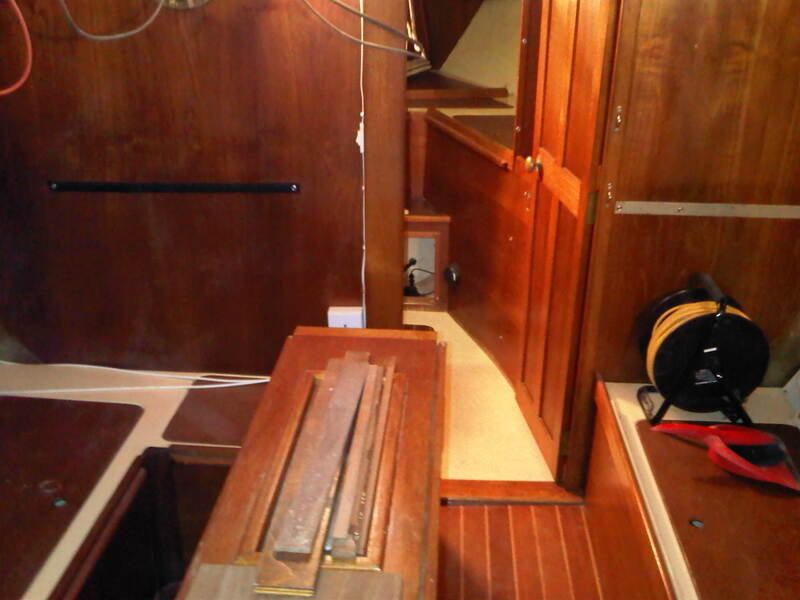 A fully restored port quarter and the toe rail is back on. 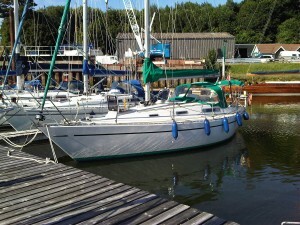 August 2012. 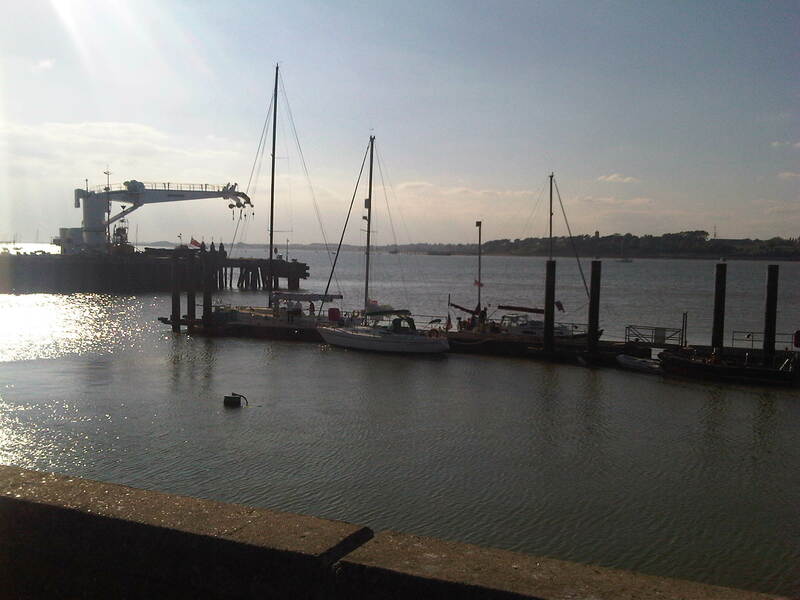 The port quarter is completely sound. August 2012. 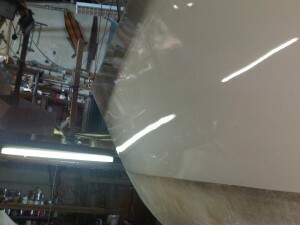 The stem is fully repaired and waiting for the top coats. August 2012. 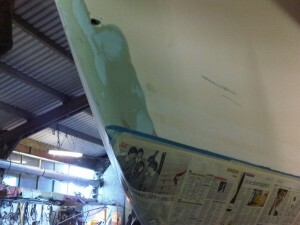 Preparations to finish the top sides but no hurry due to the moisture levels below the waterline. August 2012 and still in the Larkman’s Ltd Shed. 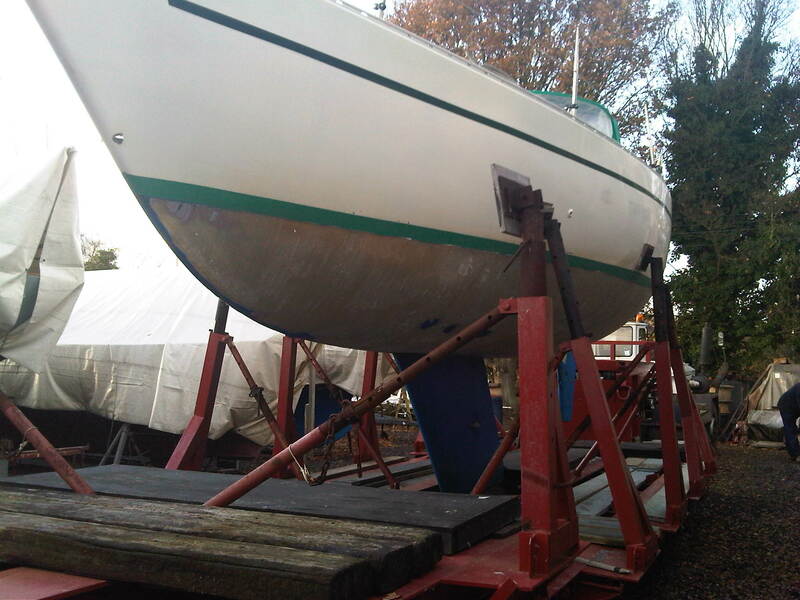 She is still wet below the waterline but has dried in patches so ……progress is being made. 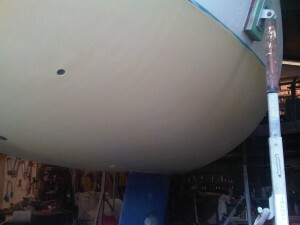 February 2012. In the Larkman’s Ltd Shed. 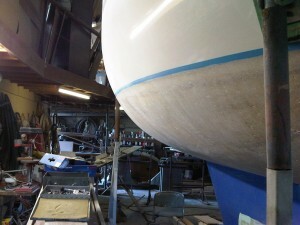 February 2012. More damage to the bows discovered and Steve has started the restoration of the stem. February 2012. Fred Larkman and James Palmer have removed the toe rail. 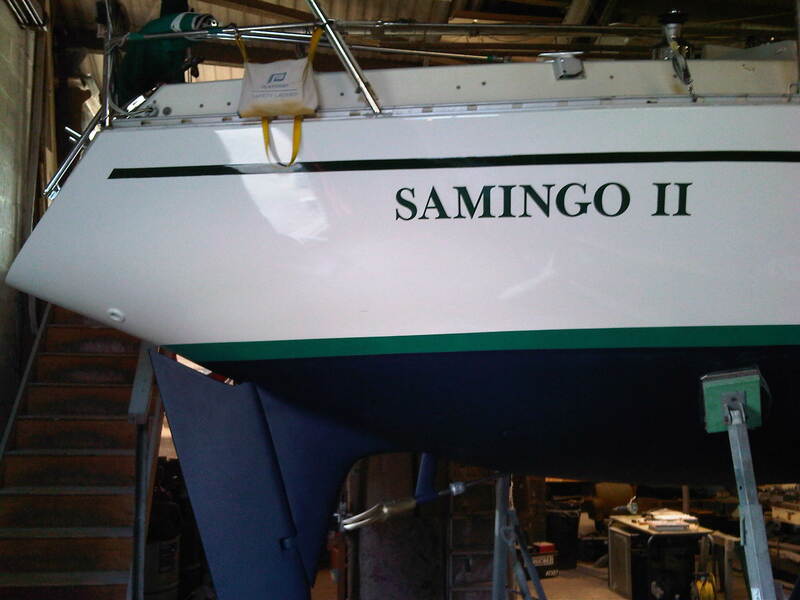 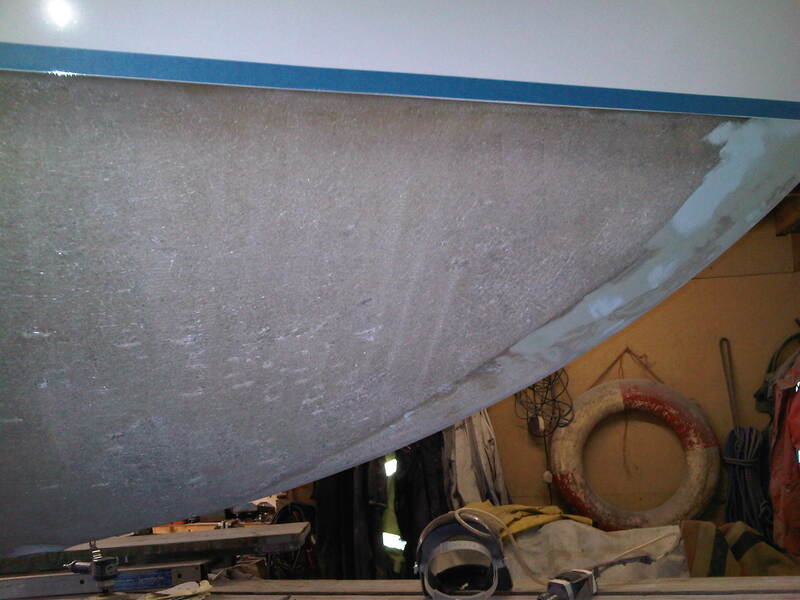 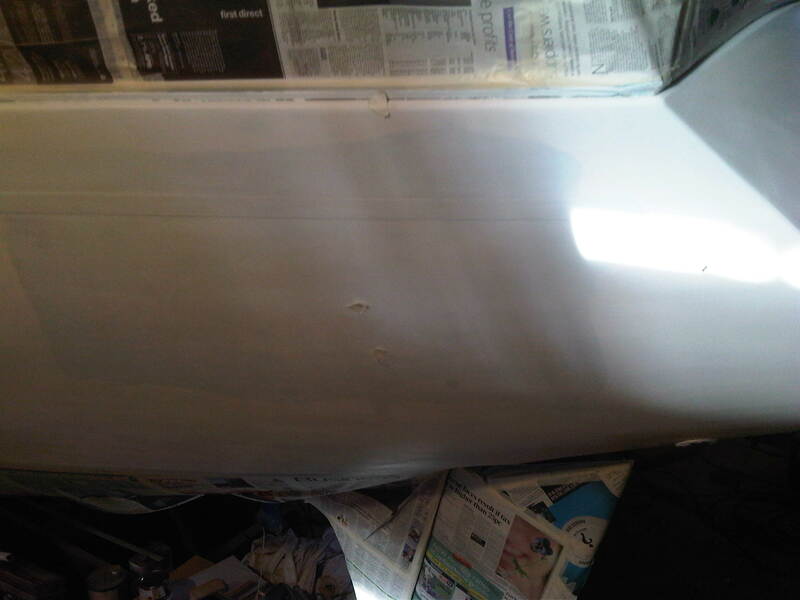 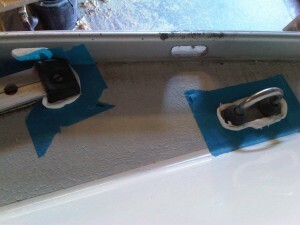 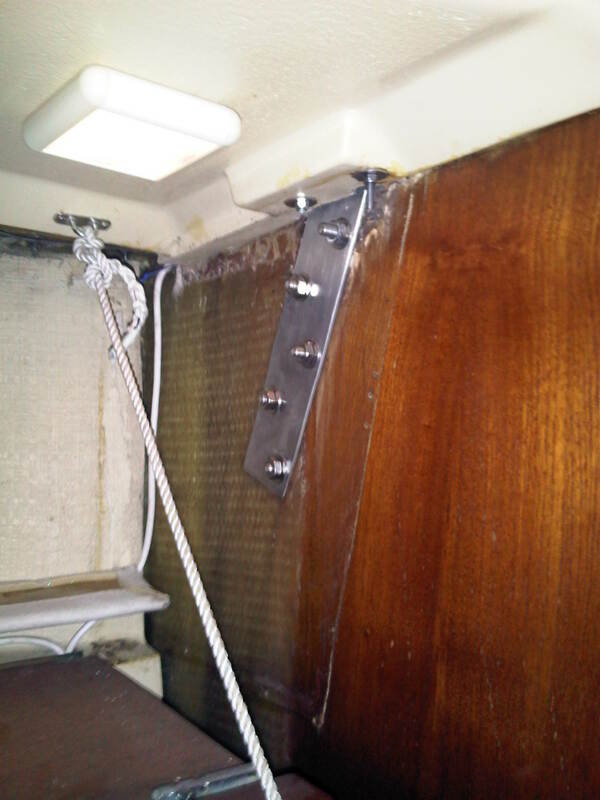 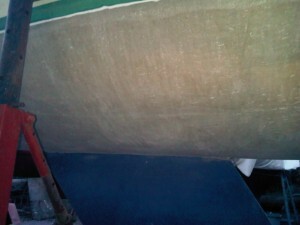 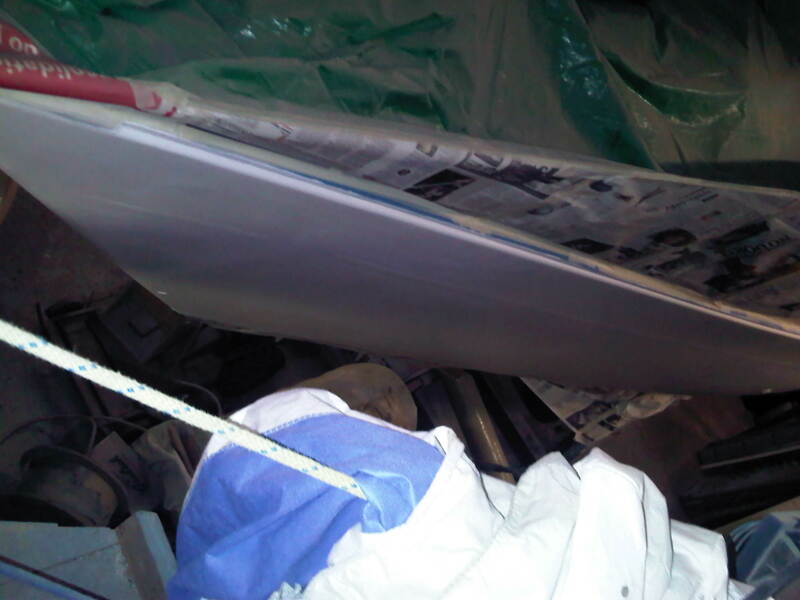 Samingo ll had suffered from mild leaking through the deck when pressed and sailing close hauled. 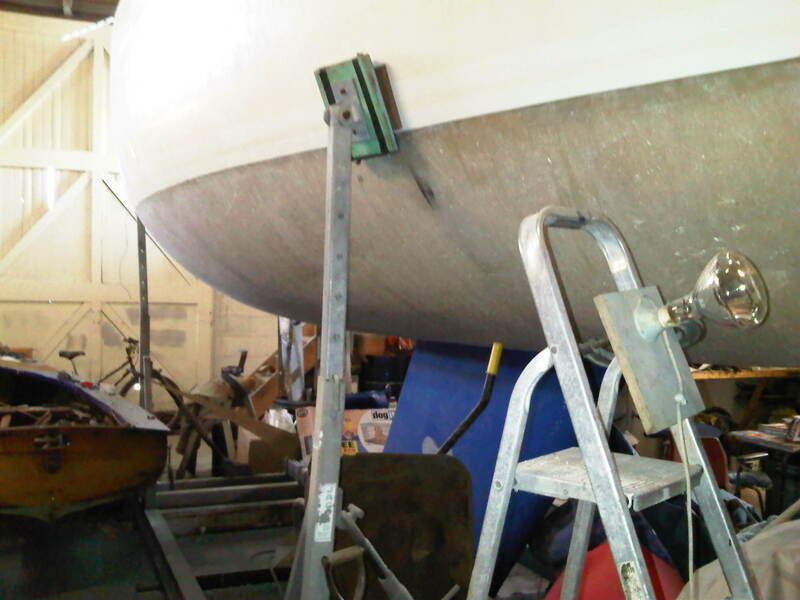 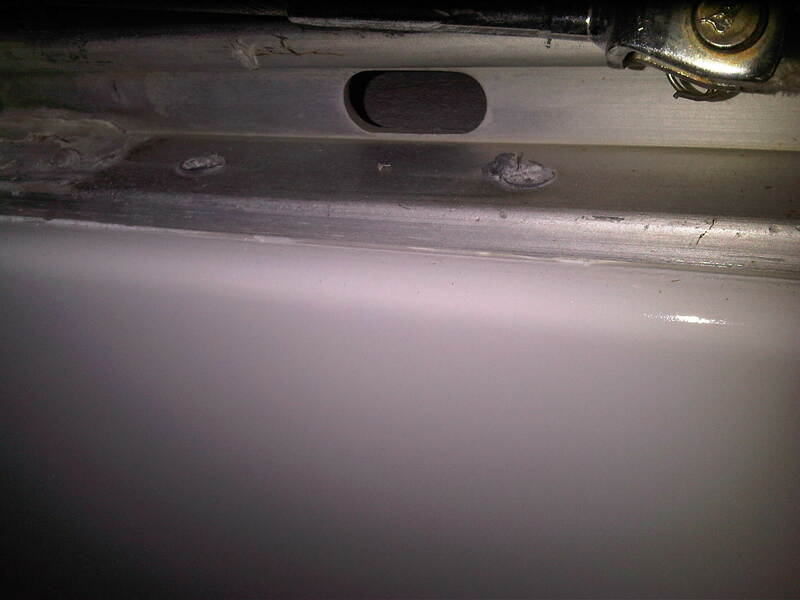 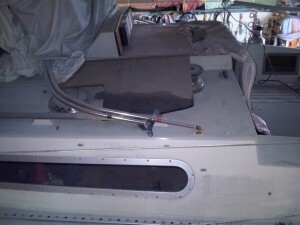 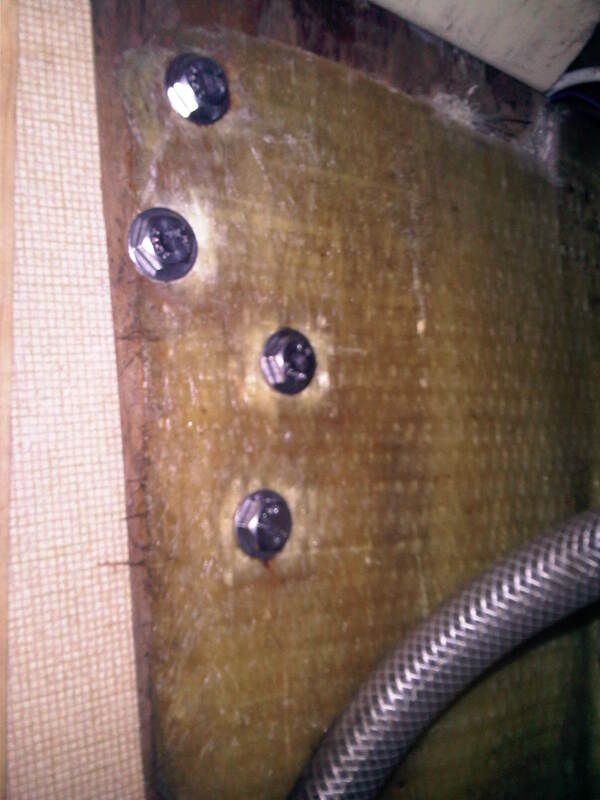 The deck is through bolted to the hull and when these bolts were removed the toe rail literally lifted off. Fred and James will rebed the toe rail properly as it is unlikely it was very well done when she was built. 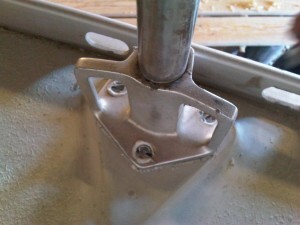 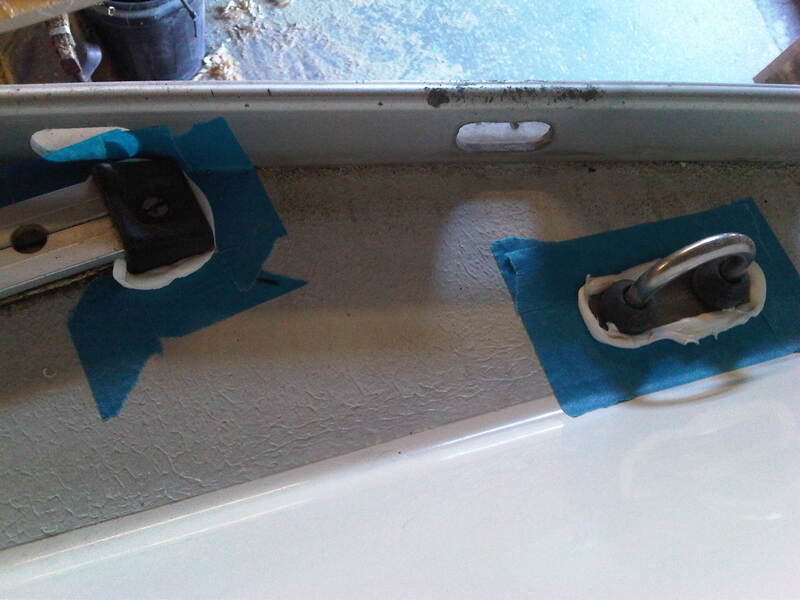 This is not uncomplicated as many of the nuts are difficult to access behind the internal mouldings and joinery. 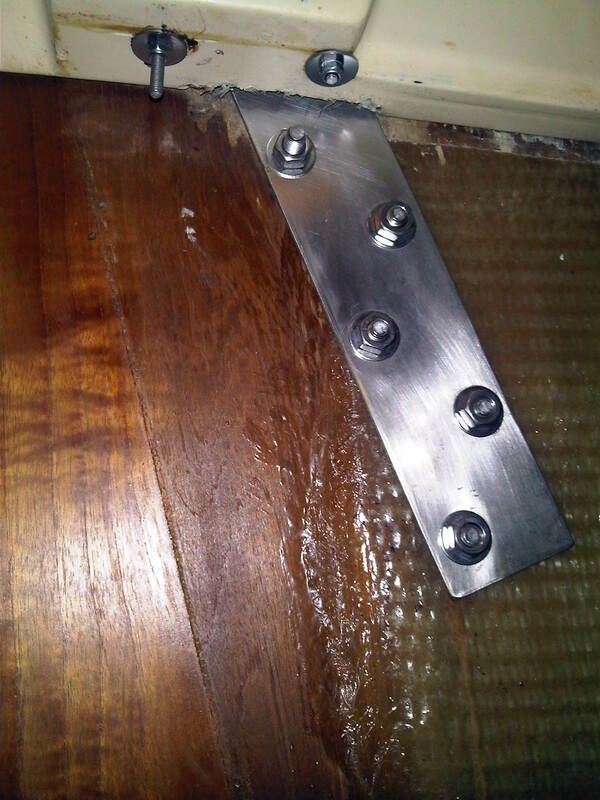 There is a bolt approximately every inch along the deck. All nuts and bolts are to be replaced. 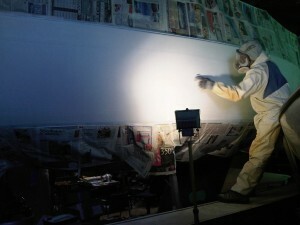 February 2012. The top sides have been stripped. 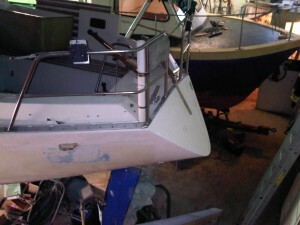 January 2012. More taking off the poor respray. 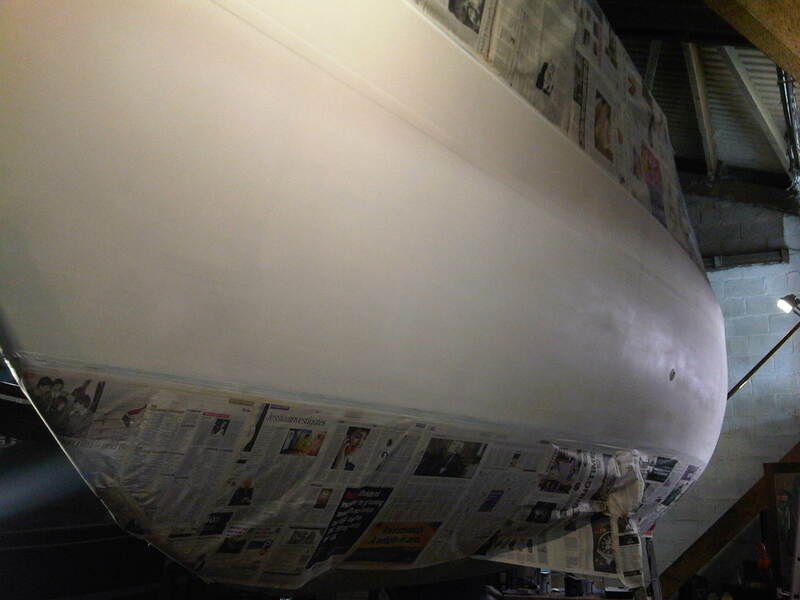 The long drying process continues in the bone dry shed. 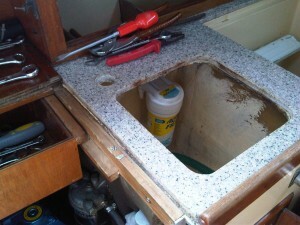 Steve Larkman insists it dry naturally. 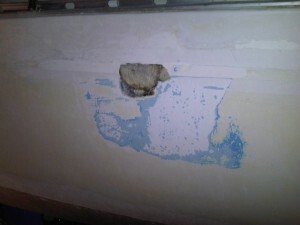 An extremely poor repair revealed. January 2012. 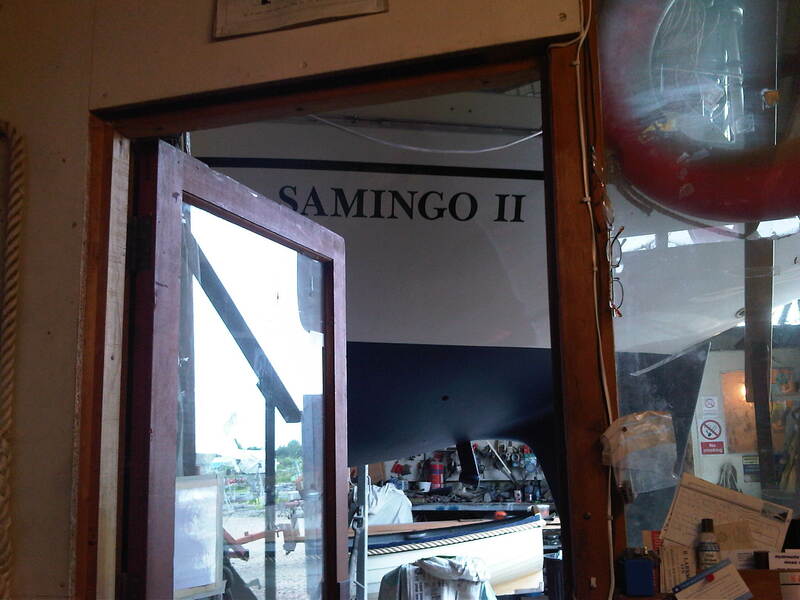 Samingo ll is moved in to the Larkman’s Ltd Shed. 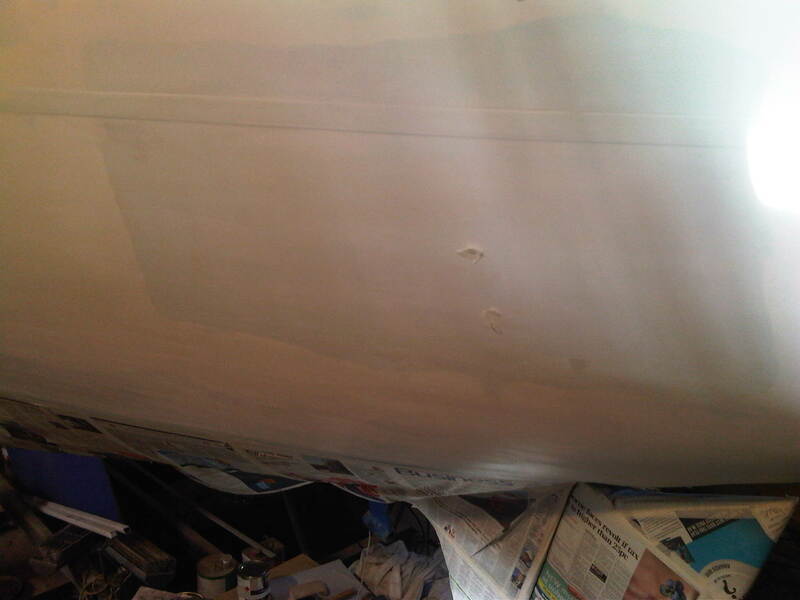 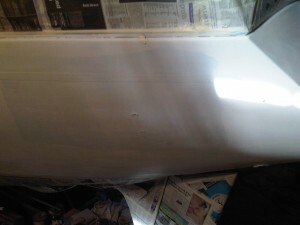 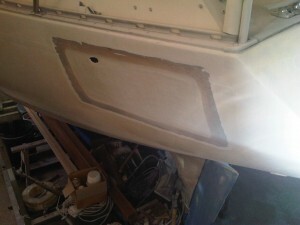 And the removal of a very poor top side Spanish re spray circa 2004 to reveal some damage and poor repairs. December 2011. A perfectionist at work. 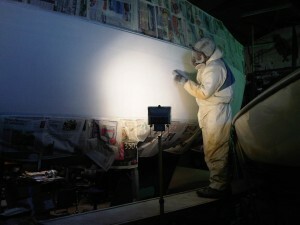 Steve Larkman. December 2011. The hull can begin to dry. 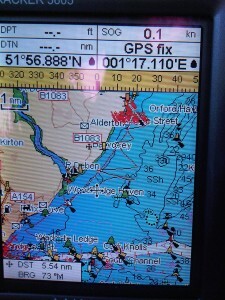 Little did I know how long it would take! 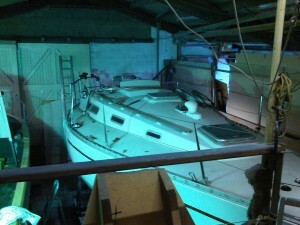 December 2011. In the Larkman’s Ltd Boat Yard, Melton. 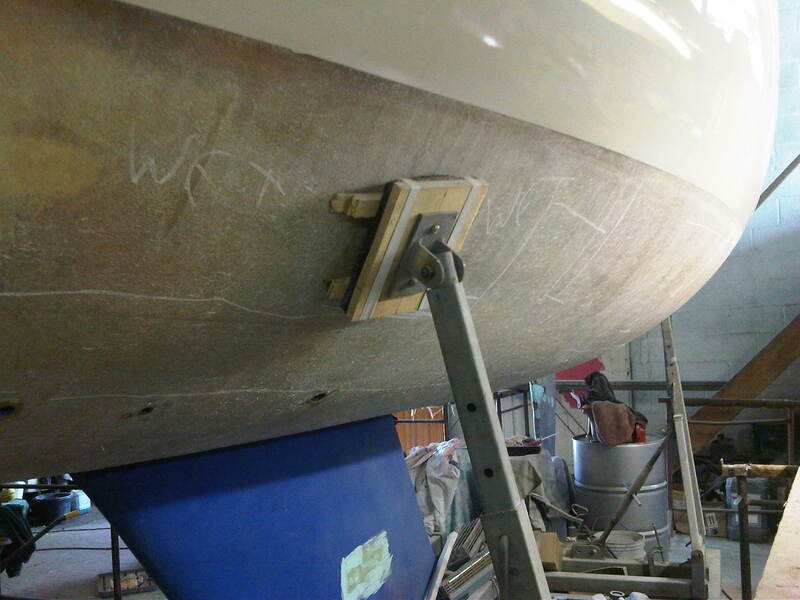 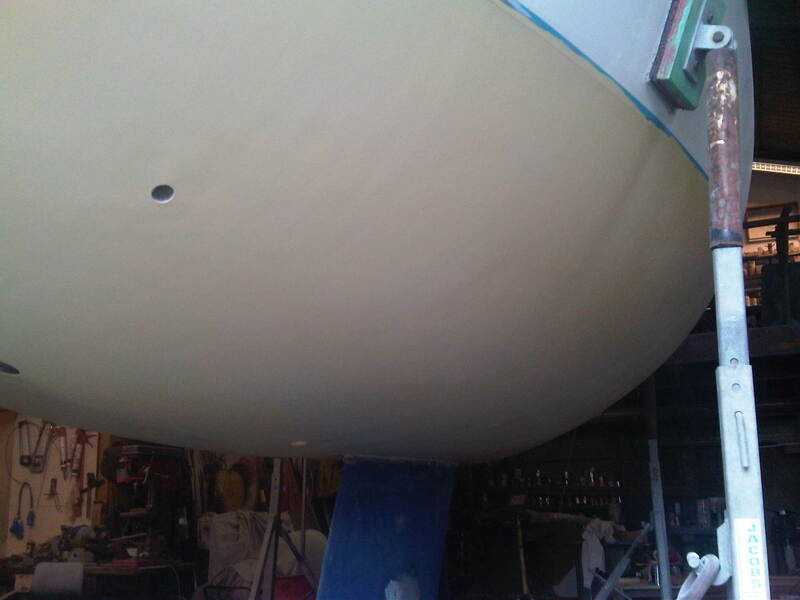 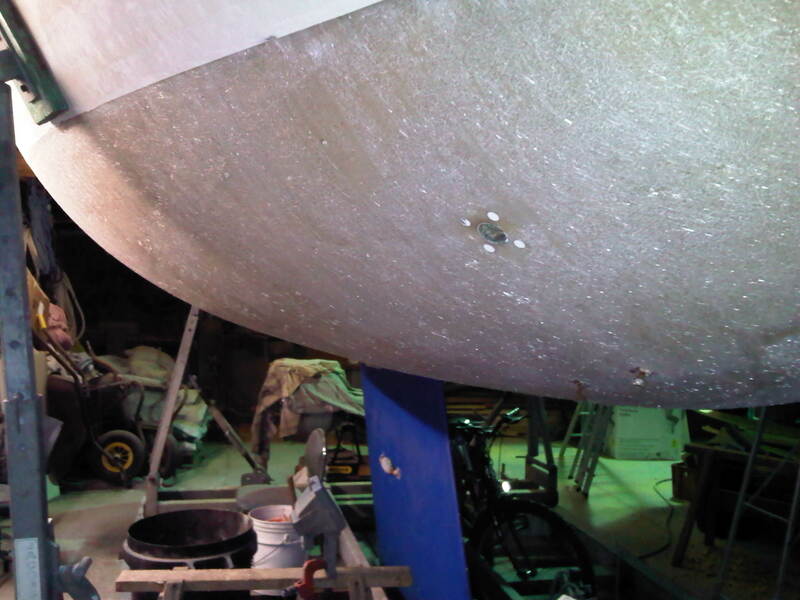 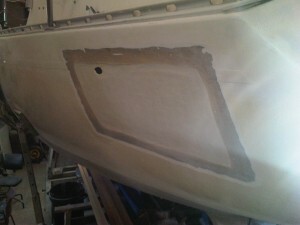 The hull has been sand blasted. Winter 2008 – 2009. 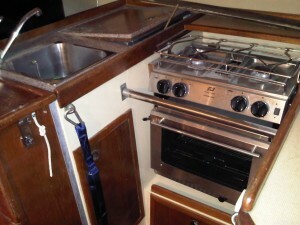 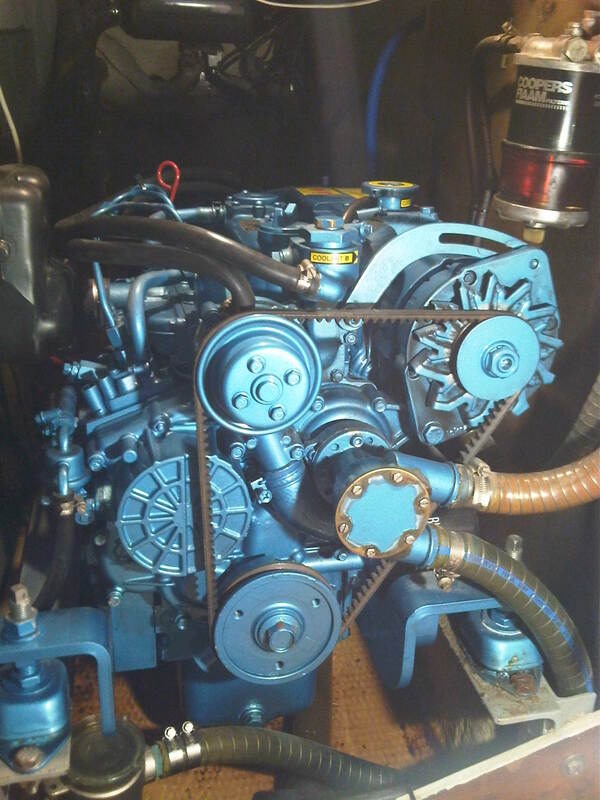 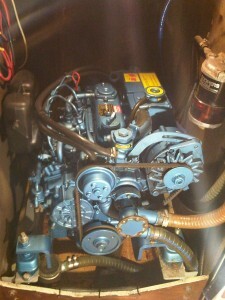 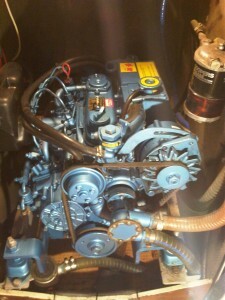 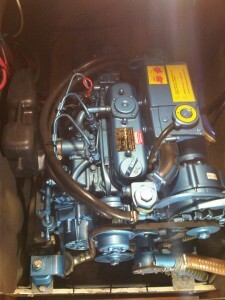 Peter Norris, Larkmans Ltd resident Engineer, installed this new Nanni 29 in 2009 complete with new engine bearings. An immaculate Norris installation. 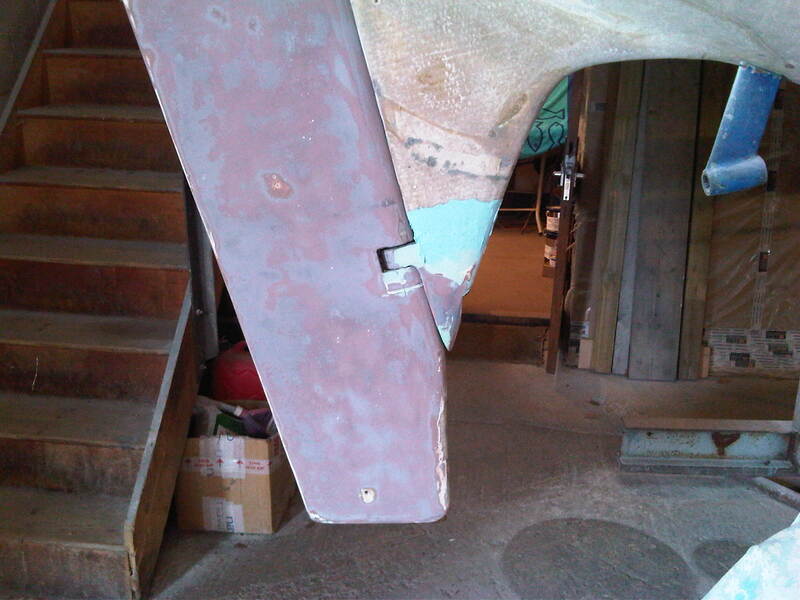 These photos were taken in May 2013. 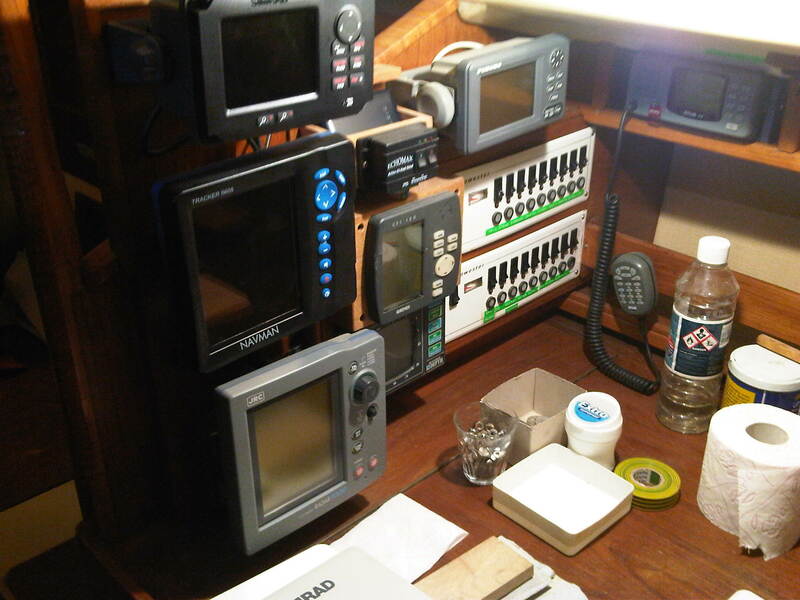 I’ll be like a kid with a new toy. 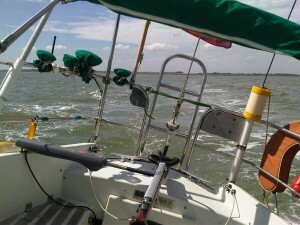 You better come too as I might be like a child behind the wheel of a car for the first time alone on the road. Lovely job. 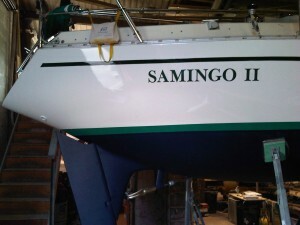 Think I have next one to be built, 247, but I would buy Samingo like a shot if I hadn’t bought Jesame II last October. Asking price seems fair considering amount of replacement kit. 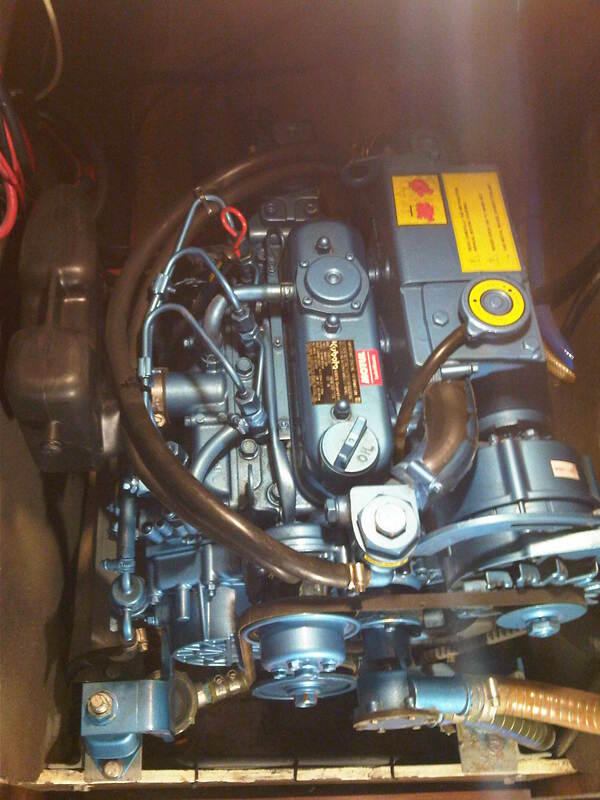 I think my VP 2002 has v. low hours and hopefully won’t need replacing but Yanmar looks v. nice but I guess a lot more expensive than Beta 25.